Then a video must be worth at least 10,000! 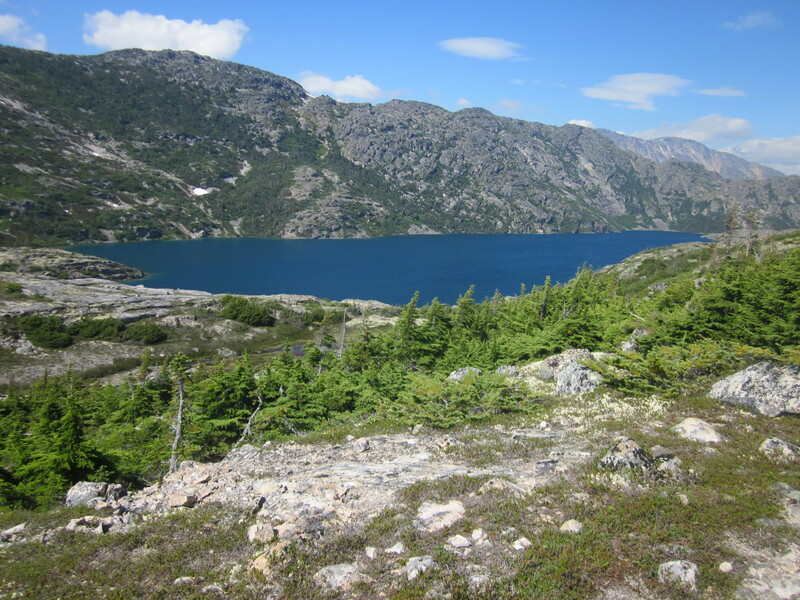 Here’s the video from our hike on the Chilkoot! Bill did an awesome job at putting it together! So, sit back, grab a snack (it’s 24 minutes long), and enjoy! 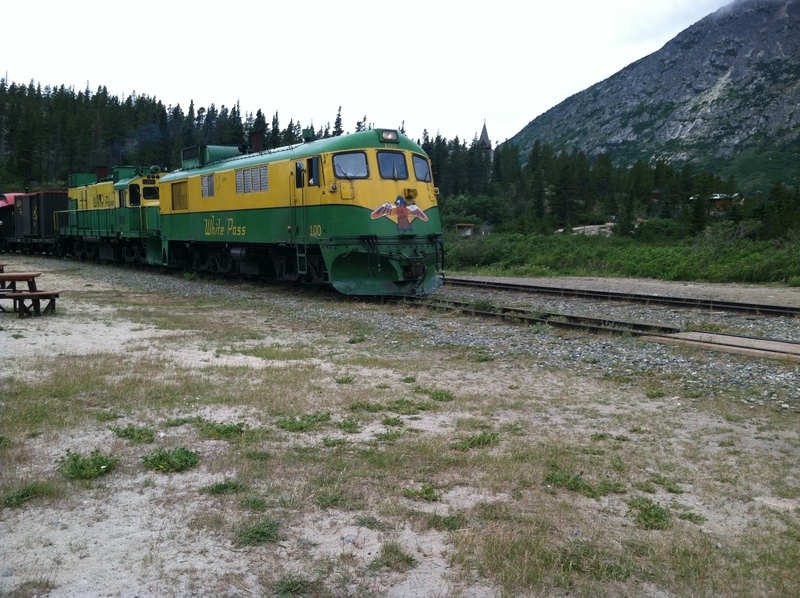 We had a 4 mile hike in front of us to Bennett, where we would catch the train at 11:30am, Alaska Time. If we missed this train, the next one didn’t arrive until Tuesday- and there was no guarantee you’d get on it, if the train happened to be sold out. Needless to say, we wanted to make sure we were up and on the trail with plenty of time to spare, just in case. We had planned to wake up around 6am, but going to bed so early and the early rising sun made us wake up a little after 4. We thought about going back to sleep, but decided that we were up, so we might as well get moving. 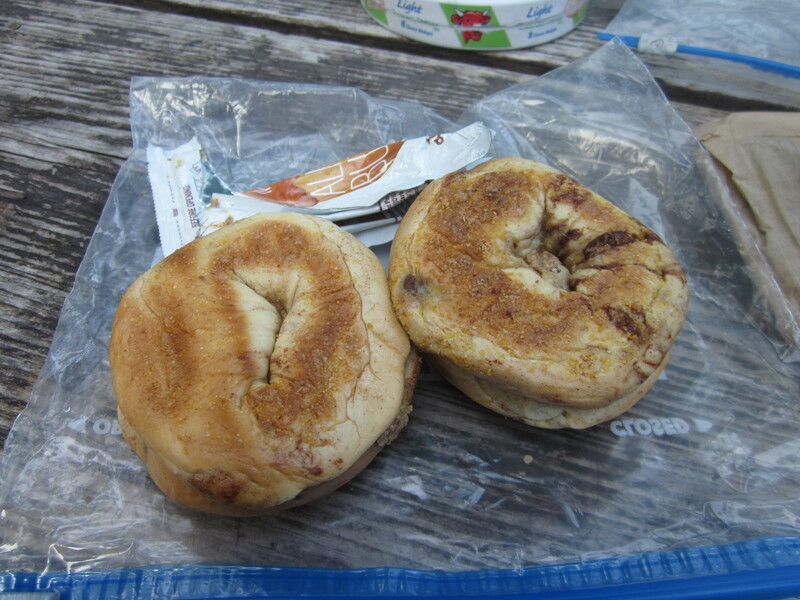 We started with a breakfast of bagels and peanut butter, my favorite! Then, it was off to Bennett! These four miles went by pretty quickly. Before we knew it we were at a log cabin, which I had heard some people talk about in one of the camps. I came to find out later that the log cabin they were talking about was different that this log cabin, but it still gave me hope that we were close to the end. 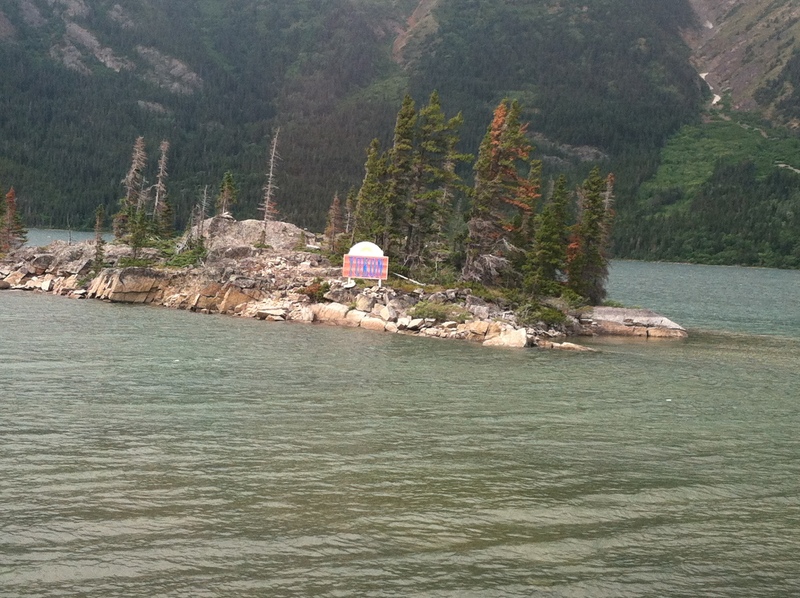 I actually read somewhere that there were some private residences close to Bennett, so this may have been someone’s vacation cabin? 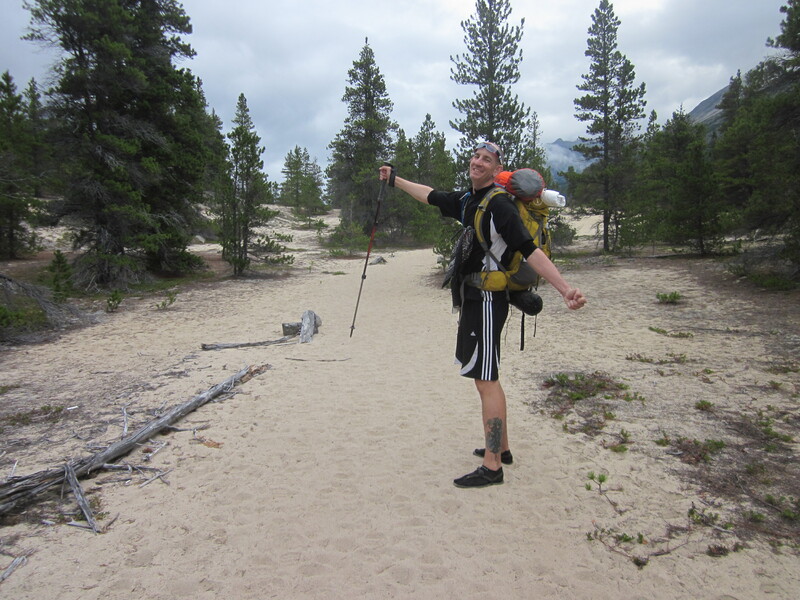 Right after the cabin, the trail became sandy. I mean like walking across a beach in the soft sand sandy. It was pretty tough to walk through it with my shoes; it felt like I was walking through quicksand. Bill’s sandals allowed the sand to gather between his feet and the sandal which was not comfortable. So, we decided it might be easier to run. And you know what, it was easier, or at least more pleasant for the several hundred yards we ran. The quicker we got out of the sand, the better. Thankfully we both had even lighter packs since our food was just about all gone. Soon, off in the distance I saw what appeared to be a church steeple. We HAVE to be close! We started jogging again and sure enough, we were at St. Andrews Presbyterian Church. 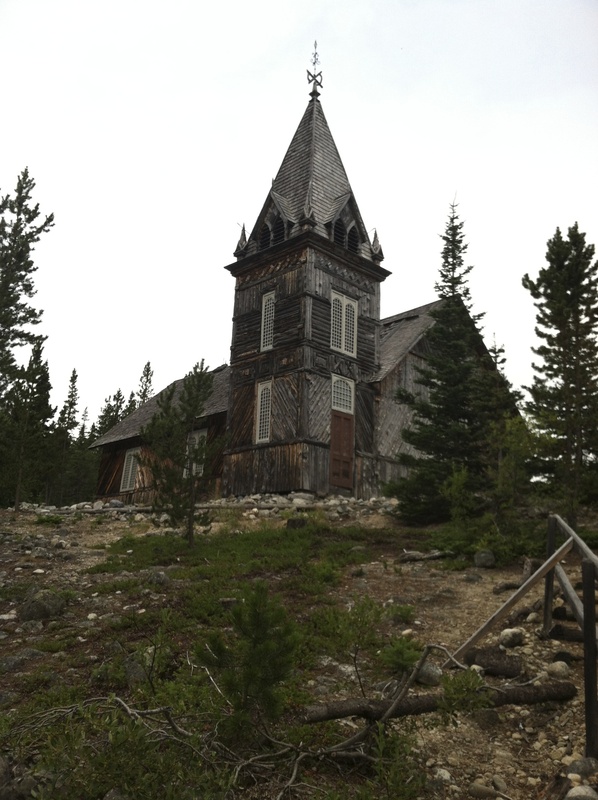 This church, built during the gold rush, isn’t in use anymore, but it’s the only gold rush building in Bennett still standing. We could see the train station down at the base of the hill: we had done it! I’m sure we both had huge smiles on our faces as we walked (or maybe skipped?) down the last part of the trail to the Bennett train station. 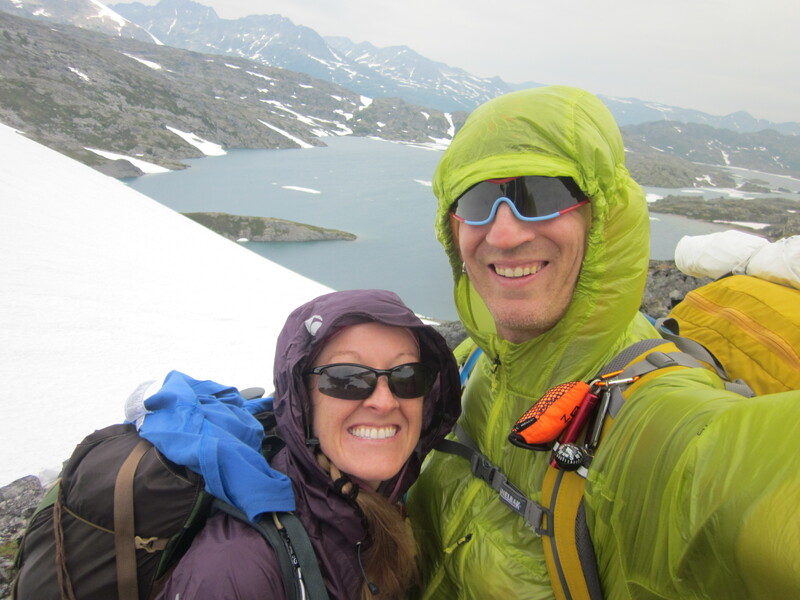 We stopped to pose for a picture by the “Chilkoot Trail” sign when it started to sprinkle. I was SO happy that we didn’t have a drop of rain until now. We had ABSOLUTELY perfect weather for our hike and I couldn’t have been more thankful. We asked someone for the time and realized it was only a little after 8am- we still had over three hours to kill. So, we sat on the porch of the train station and waited. 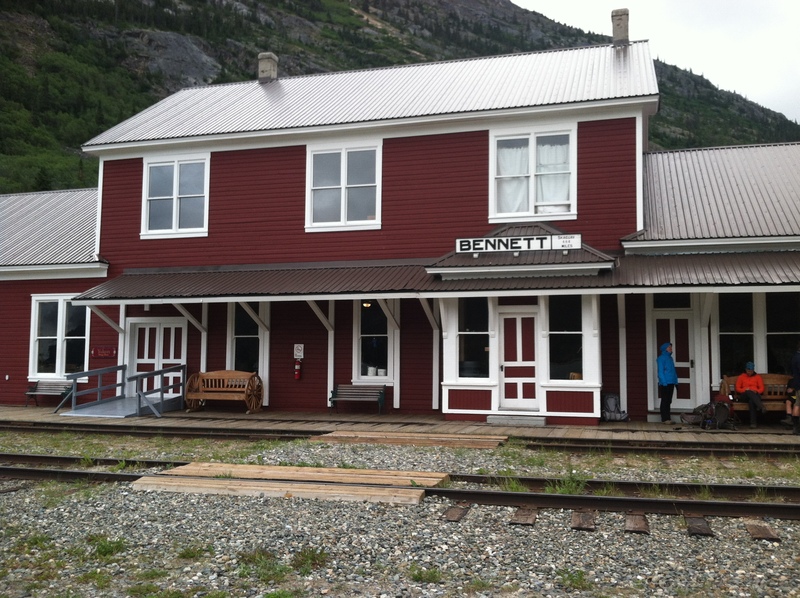 The Bennett train station is a stop on the White Pass and Yukon Railroad, and many tours starting from Skagway, full of cruise ship passengers, stop here. There’s actually a kitchen and several dining rooms-decked out with fine china and everything- for the tourists. 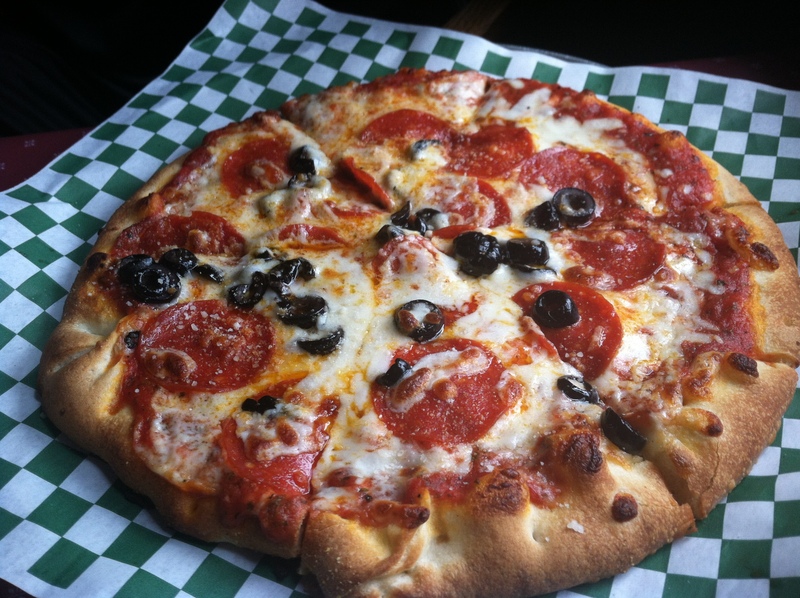 Recognizing that hikers would deeply appreciate a hot meal after the trail, the station also offers lunch to the hikers for $15 each if you purchase your tickets ahead of time. 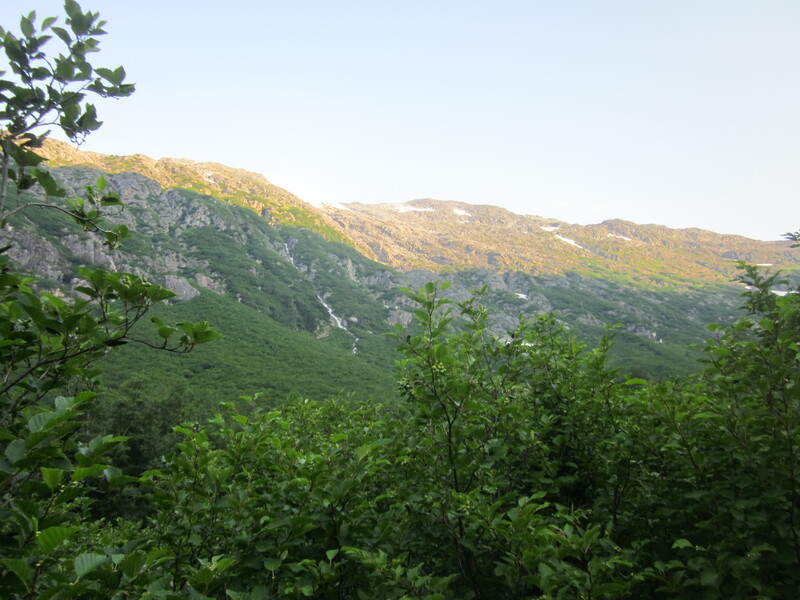 However, hikers do not eat with the tourists, they get their own special dining area all to themselves. They opened the doors for us around ten, and we were happy to get out of the chilly morning and to some real food! 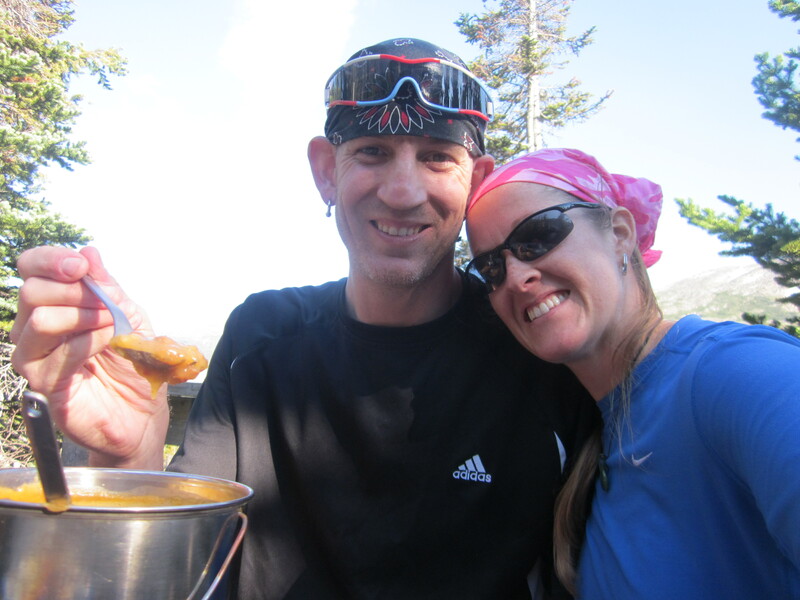 About half of the hikers we met along the trail had pre purchased meal tickets; I was so thankful we had! 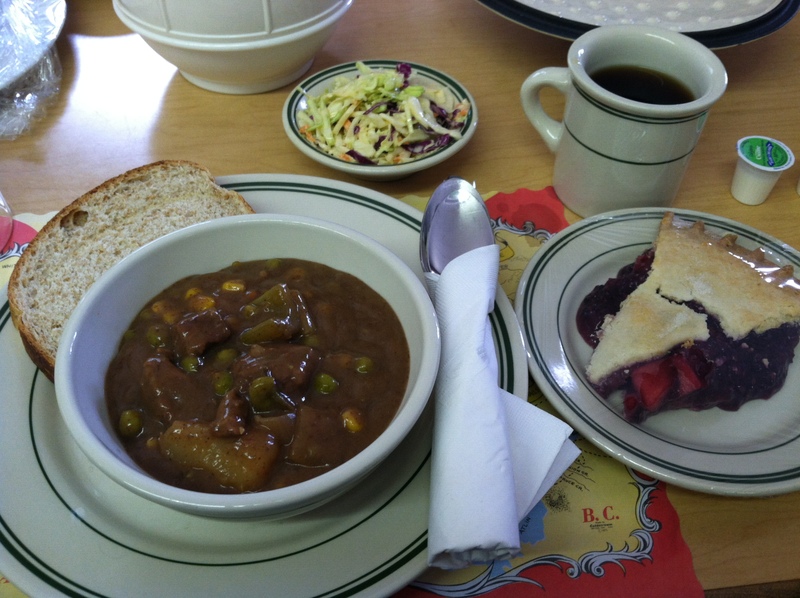 They served us beef stew, bread, cole slaw, and a mixed berry pie. I’m not typically a beef stew kinda gal, but man, was this tasty!! The berry pie was quite good too- I think it even had rhubarb in it! We filled up and warmed up and around 10:30 or so the train pulled in. They offloaded the tourists into the dining halls, and then they allowed us to get on the train- but only in the cars marked “HIKERS”. Did we really smell that bad?? Since we had some time to kill, I took a few minutes to take some photos. 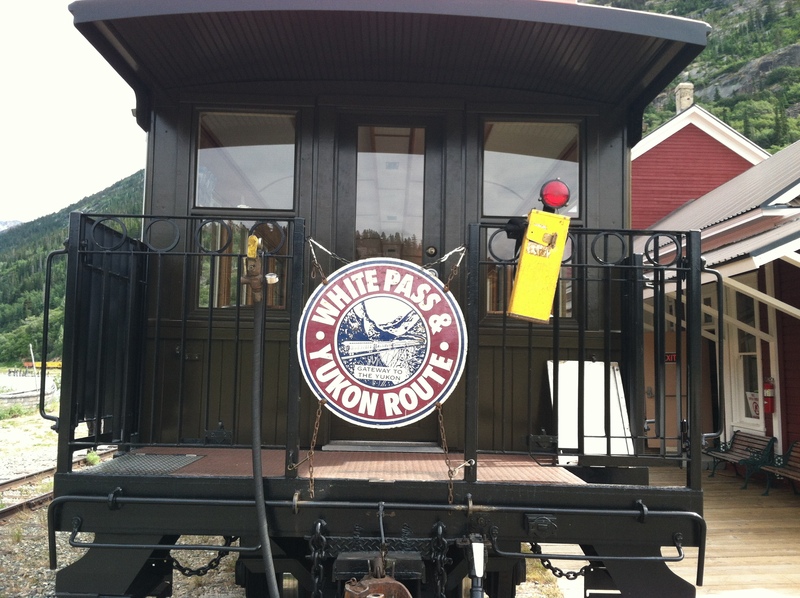 Soon enough, it was “All Aboard” and off to Carcross we went! 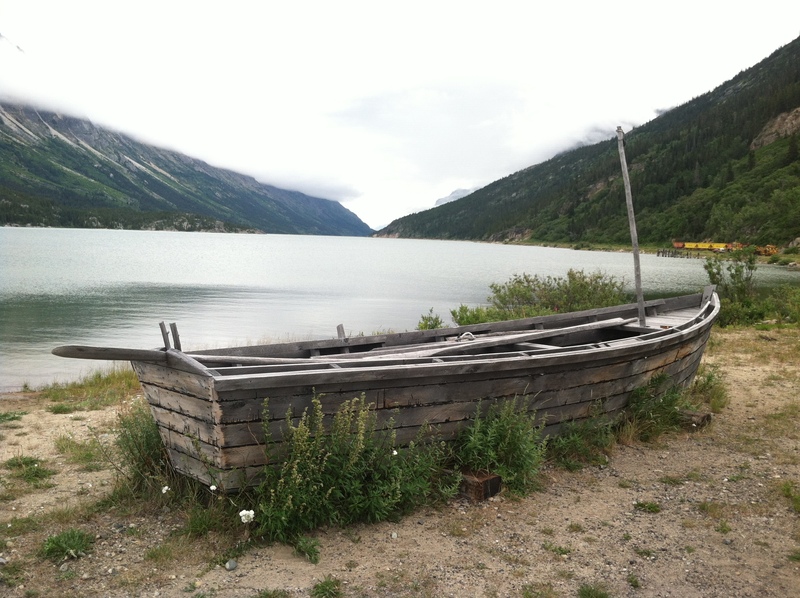 Carcross is actually north, on the way to Whitehorse, Yukon Territory, Canada. 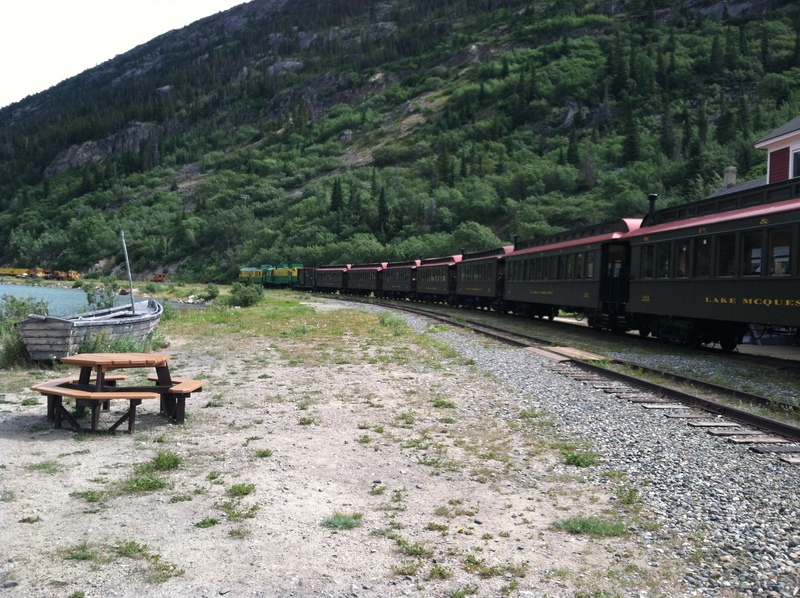 On Saturdays, the train doesn’t run south, so we had to go north only to come back south to Skagway. It was kind of neat riding on the train. The cars were heated with old fashioned heaters and there was a bathroom in each car. Not gonna lie, I was pretty excited to hear the flush of a toilet and use running water, even if it was on a train car! We saw beautiful scenery, but it wasn’t enough to keep me awake for the almost 2 hour ride. 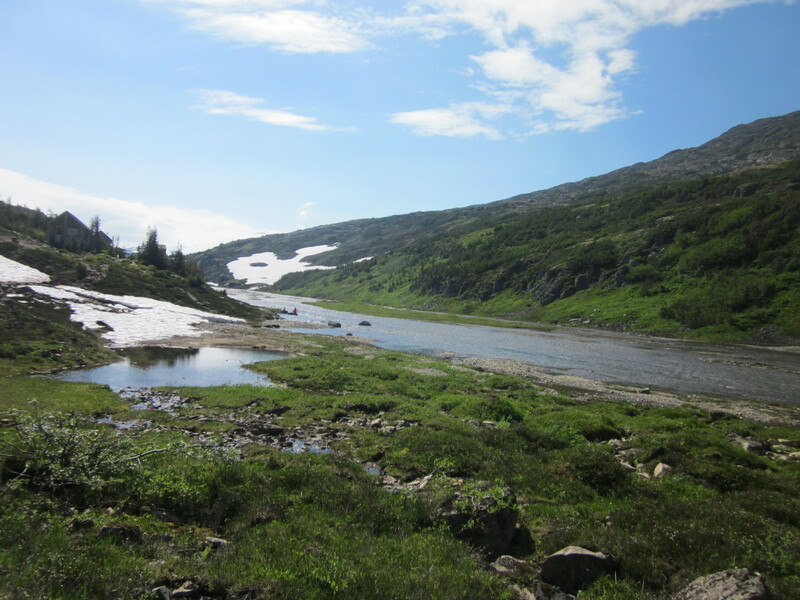 I dozed off sometime after we entered the Yukon. 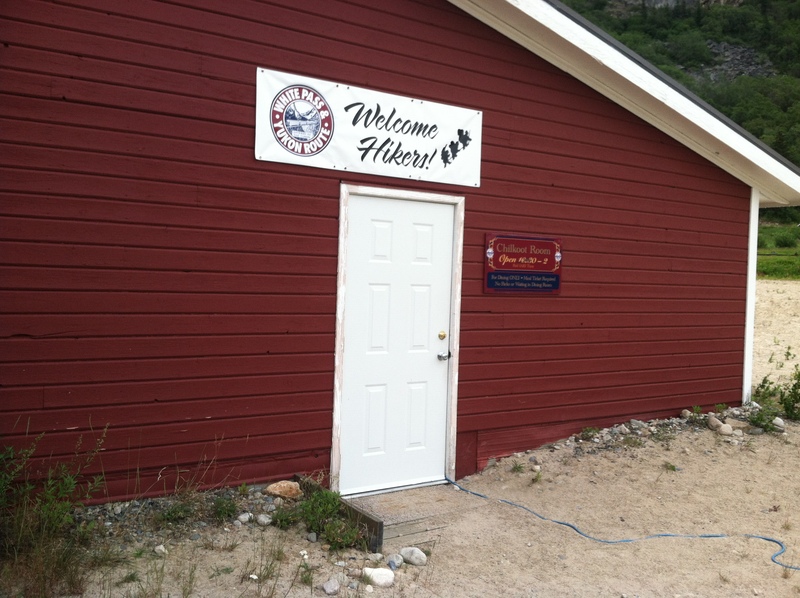 When we arrived at Carcross, we were a little confused because the conductor of the train murmured something about “train time” vs Yukon time, and then that we had 3 hours until our ride picked us up to take us back to Skagway. 3 hours? Our tickets said our ride would pick us up at 1:15, and it was nearly that time when we got off the train. Thankfully, we asked someone who looked like she ran a tour company what the deal was. She said that she was looking for the Gibson party and for the Pierce party. The Gibson party? That’s us! So we didn’t have to wait 3 hours? Thank GOODNESS! Our driver was really chill and she actually let us run across the street to the little general store to get some ice cream for the road. Man, did that hit the spot! We hopped in her van, Bill and I, and the Pierce family- our friends from Deep Lake- and we headed south towards the American border. 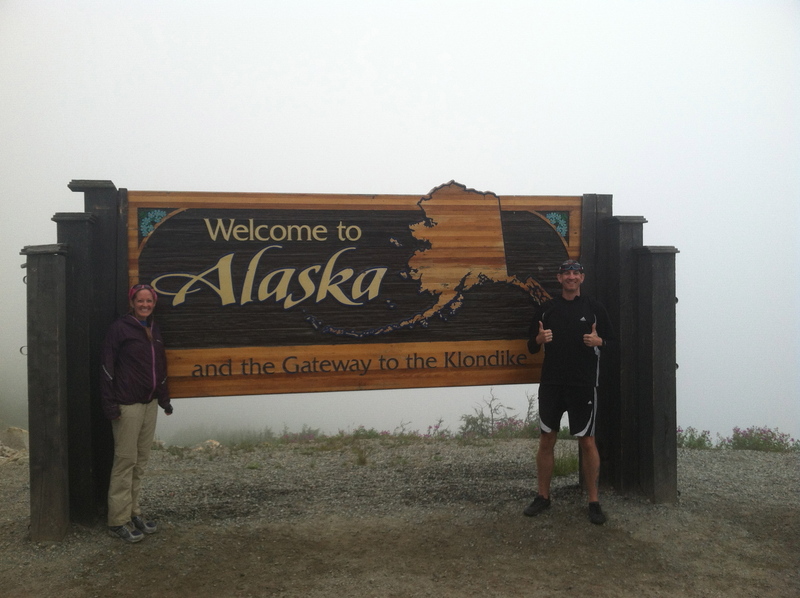 On our way we stopped for the obligatory photo at the Welcome to Alaska sign. 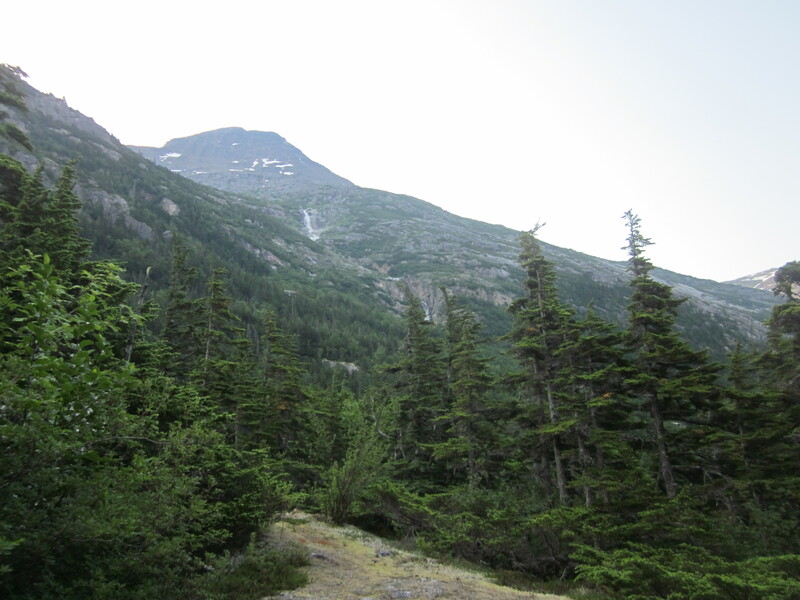 We made it back to the docks in Skagway close to 3:30 (I think). We said our goodbyes to the Pierce family and exchanged contact information with them. They had graciously agreed to give us a ride back to Juneau either Sunday afternoon or Monday morning depending on the weather, since we’d be going by boat. We said we’d be in touch as we parted ways for the evening. Bill contacted his friend Nathan to arrange for a ride back to his place where a nice warm shower was waiting for us! 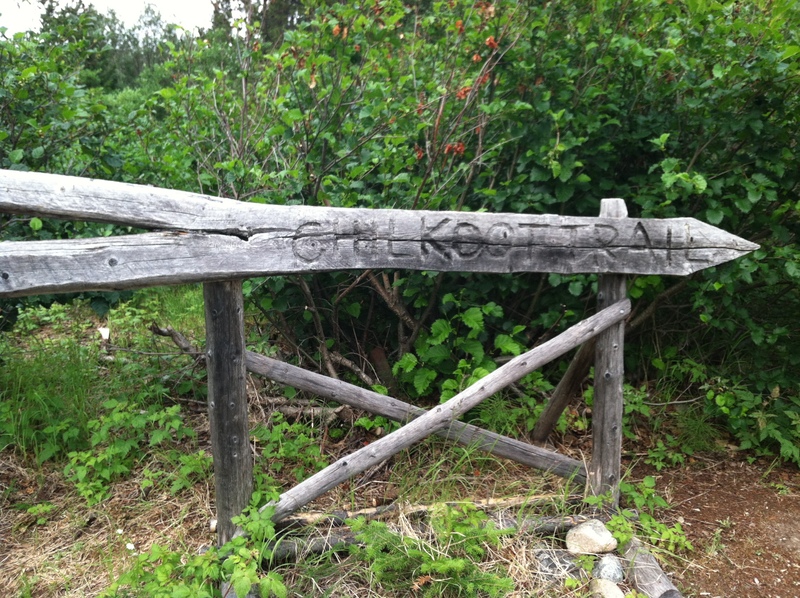 I was so proud that we had completed the trail, kind of sad that it was all over, but very excited for a hot shower and clean clothes. 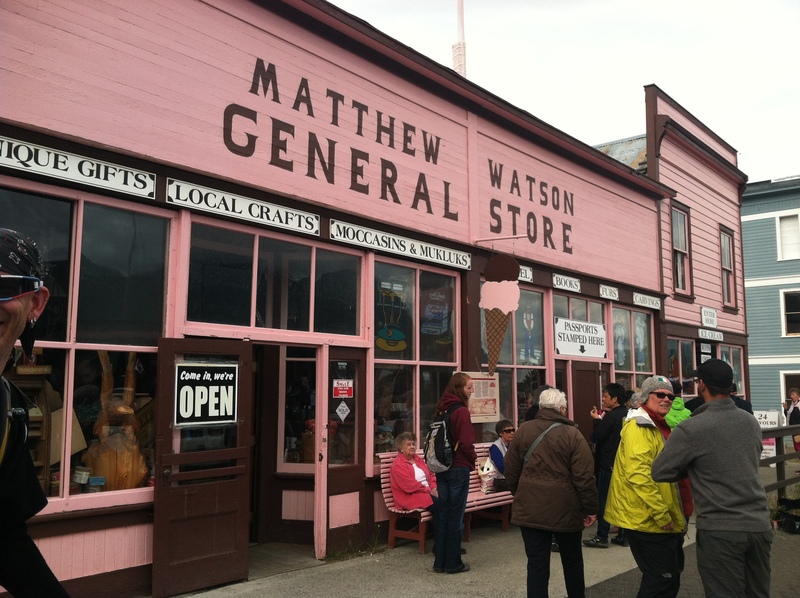 While we waited, we headed over to the Red Onion Saloon. 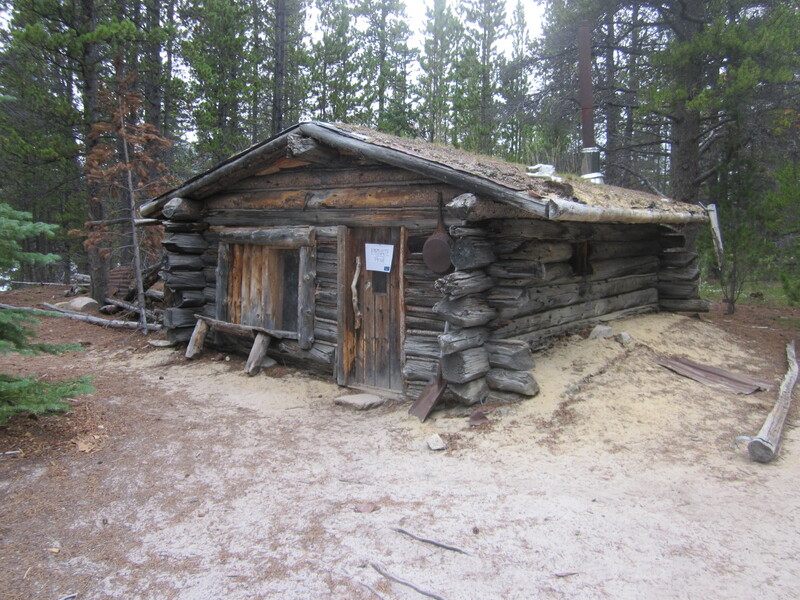 During the gold rush, this was an exclusive brothel. Since then, the Red Onion building has been used for a multitude of other purposes, but in 1980 it was converted to a bar and the upstairs became a museum, sharing the history of the Red Onion in its heyday. 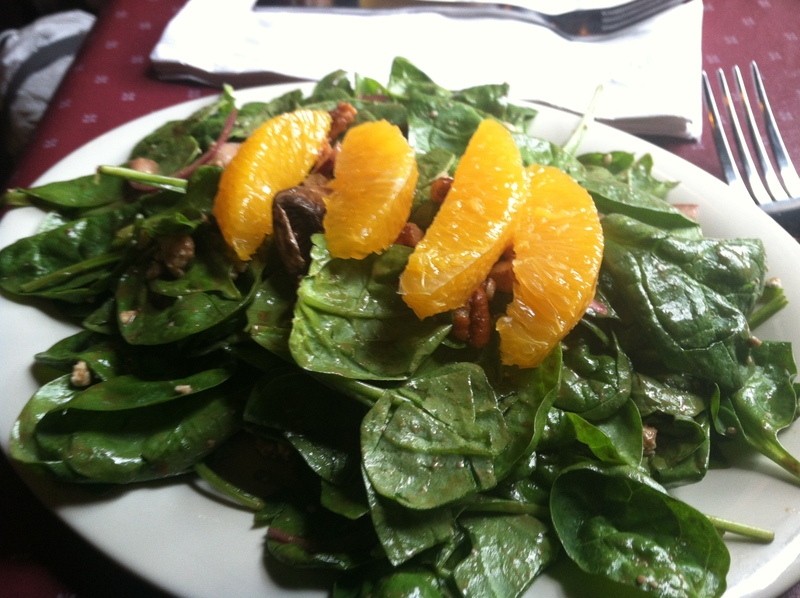 My body was craving vegetables, so I ordered a salad and Bill ordered a pizza. You also can’t forget the Alaskan Brewing Company’s Summer Ale- so good! After we ate, we met up with Nathan for a ride back to his house. Hello shower, laundry, and bed! 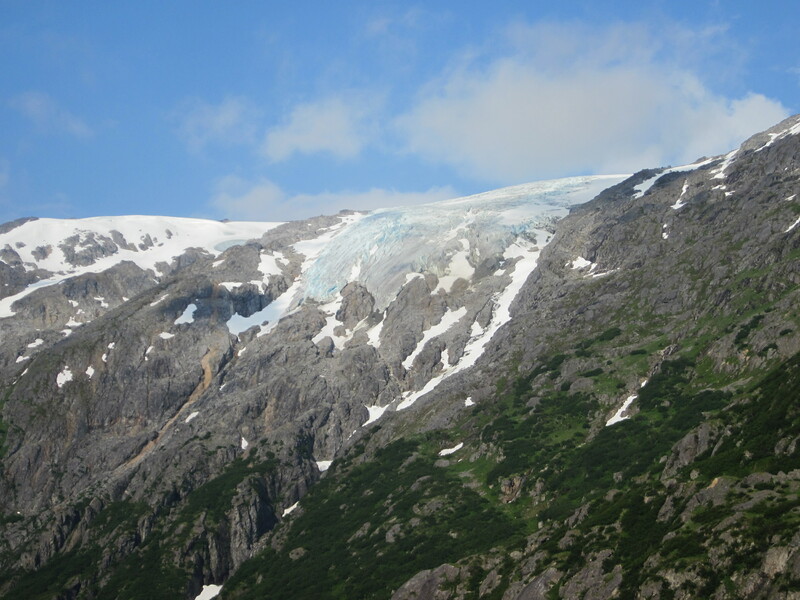 The hike may be over, but I still had a few more days of exploring Alaska- I’ll share my highlights in another post! I awoke to a rustling sound outside of the tent. Bill! I whispered as loudly as I could so I would wake him but not the other campers. There’s something outside our tent. Get the flashlight! That we needed a flashlight meant if was probably somewhere between 11pm and 3am, though again I was clueless about time. 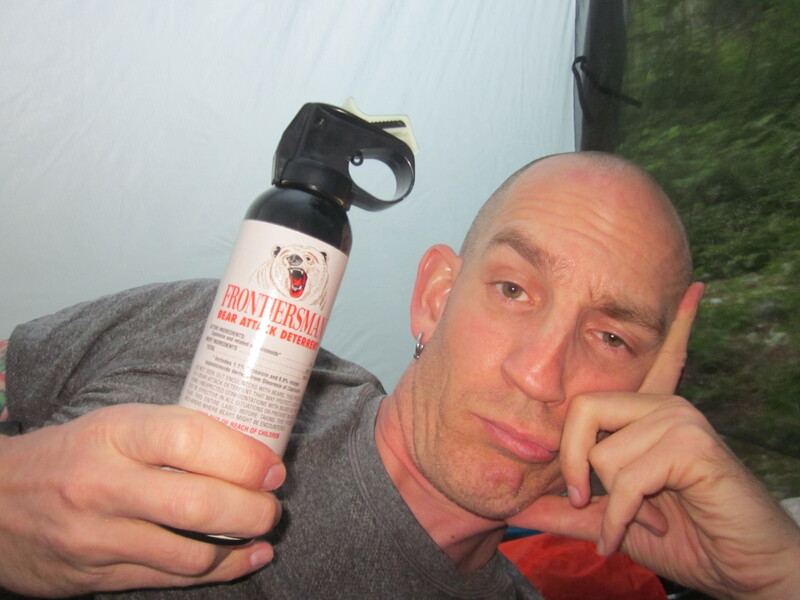 I also don’t know why I didn’t tell him to grab the bear spray, which I insisted be kept in the tent at night. Bill turned the flashlight on and directed it towards my pack, which was right outside our “door”. 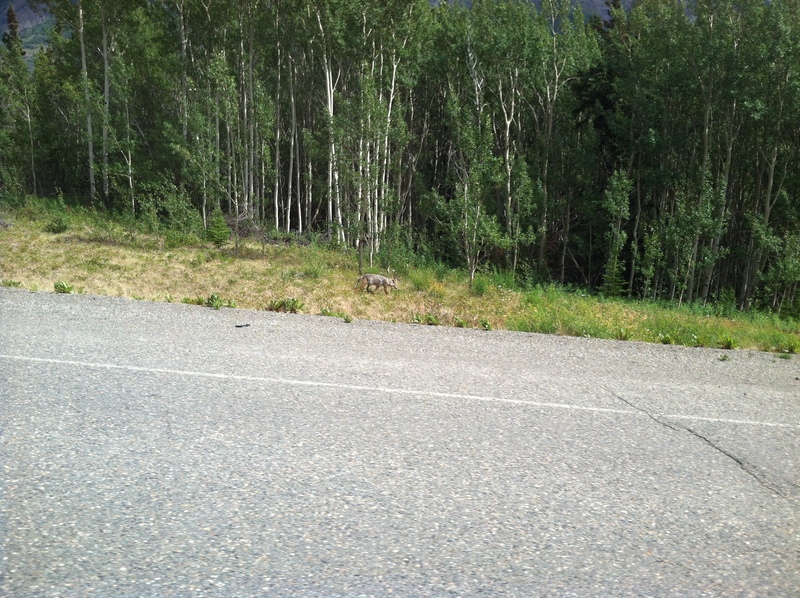 There, a small dark blob, about 2 inches long skittered across my pack. With a slight chuckle, Bill told me it was a little shrew. Phew. I was very thankful it wasn’t a bear. However, I wasn’t 100% relieved. What was in my bag that attracted the little guy? If he can smell something, I’m sure a bear could as well! I was able to fall back asleep after a little while, but I definitely woke up several times throughout the night. 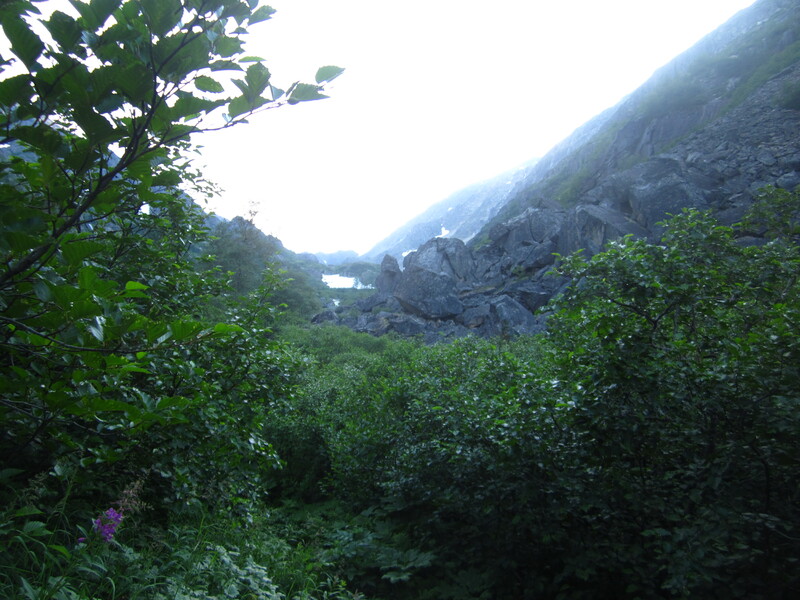 We had planned to get up around 5:15am so that we could be out of camp by 6:00am as the rangers had suggested. It was somewhere a little before 5 I think when we actually did wake up. The sun was already out and we had gone to sleep before 9pm, so we were pretty well rested and excited about today- summit day! Bill started to break down camp, while I ran to the bathroom, since I had been too scared to go in the middle of the night. 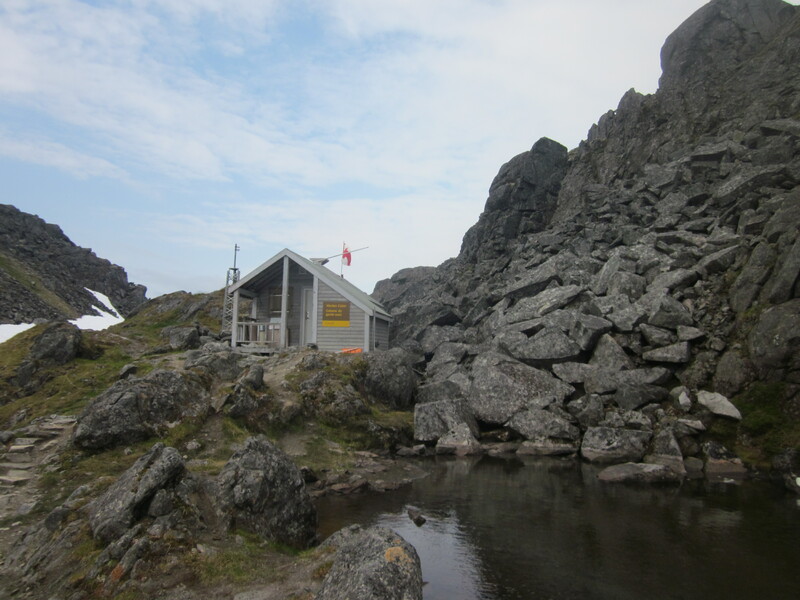 On the Chilkoot, there are outhouses at the campsites. Anyhow, we broke down camp and headed to the food area for our breakfast of bagels and nut butter (for me) or cheese (for Bill). And, we’re off! Summit, here we come! 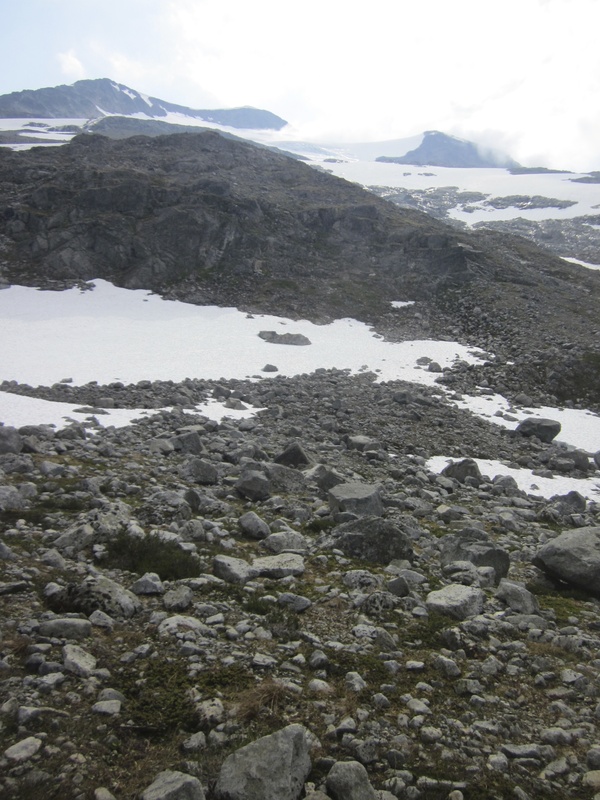 The area between Sheep Camp and the Summit was actually the danger zone for avalanches. 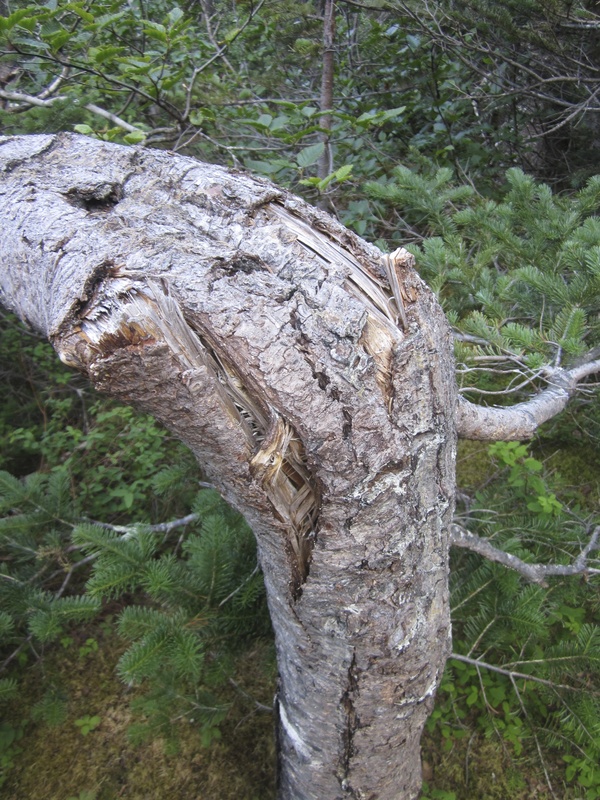 It was NOT recommended to stop and hang around on these sections of the trail. 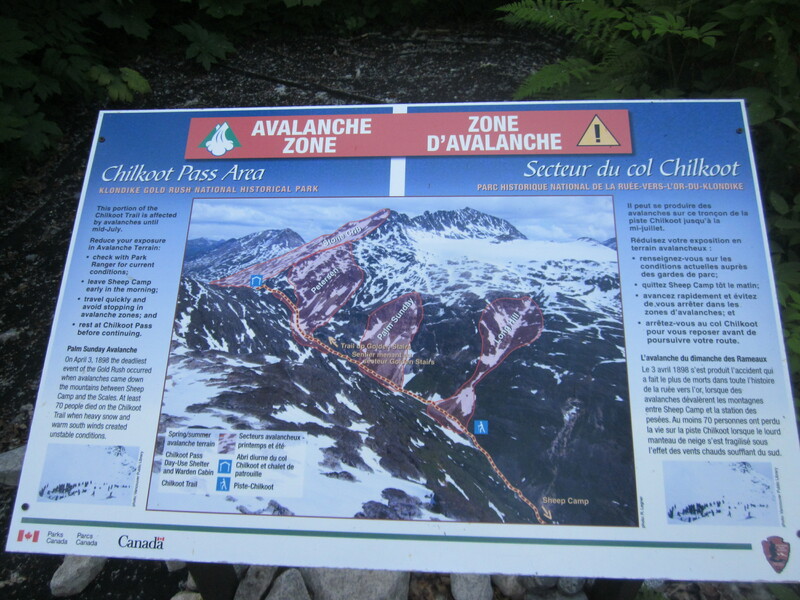 Though the avalanche warning had been lifted, anything could still happen. The sun was shining brightly and the snow was melting- we didn’t want to be around if just the right patch of snow/ice decided to break off. 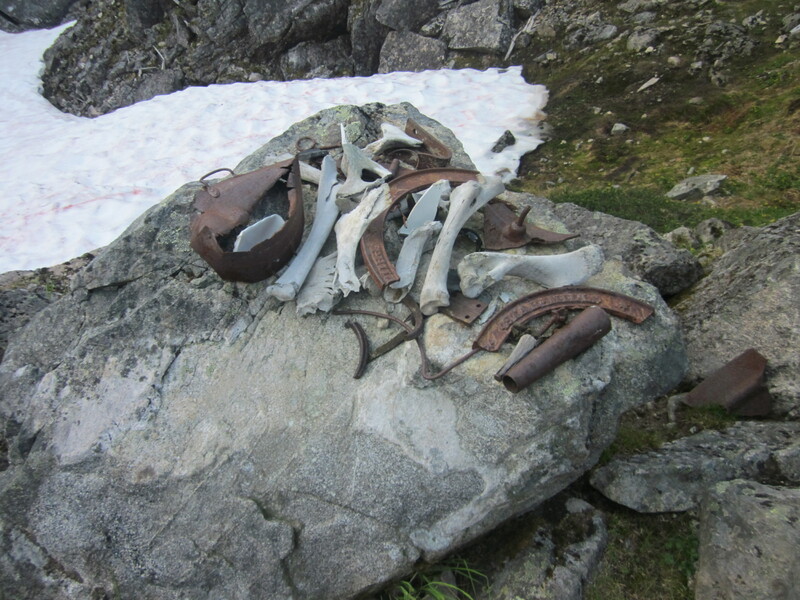 As we got higher up the mountain, we started to see some of the pieces of history left behind from the gold rush. 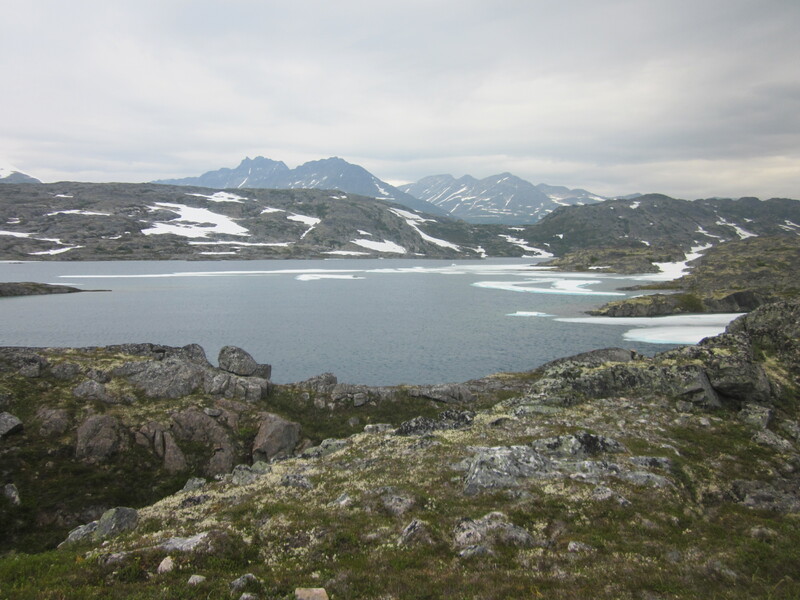 And of course, some absolutely stunning views. We also encountered our first real water crossing. I bounced from stone to stone, trying to avoid as much of the water as possible. Though my shoes claimed to be waterproof, I’m smart enough to know that they’re only waterproof to a point. I didn’t want to march right through the water just yet, I’d try to keep them as dry as possible for as long as possible. This part of the trail definitely had some of the best views. It was crazy to look back and see how far we’ve come- and to know that we weren’t even at the top yet! 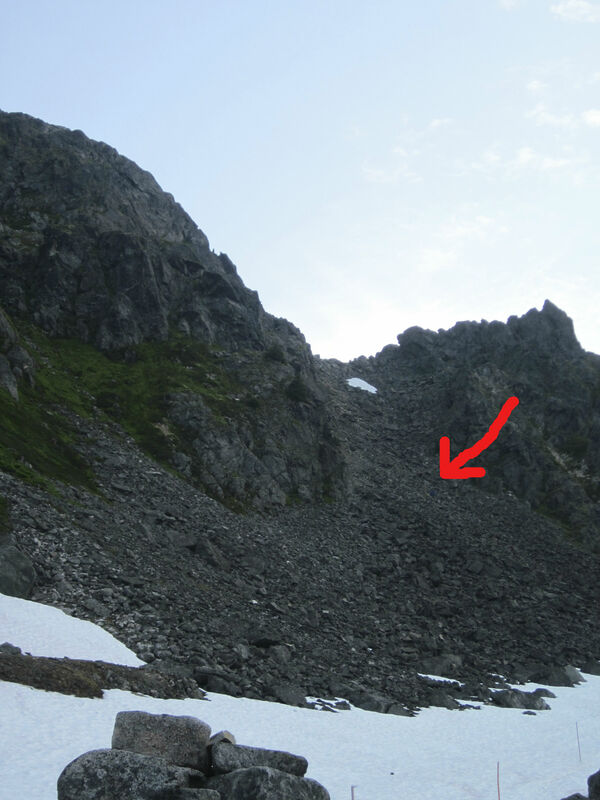 If you’re able to zoom in on the picture above, you can see other hikers a little below center, on the left hand side. We looked ahead and finally spotted what we were assuming was the Golden Staircase. 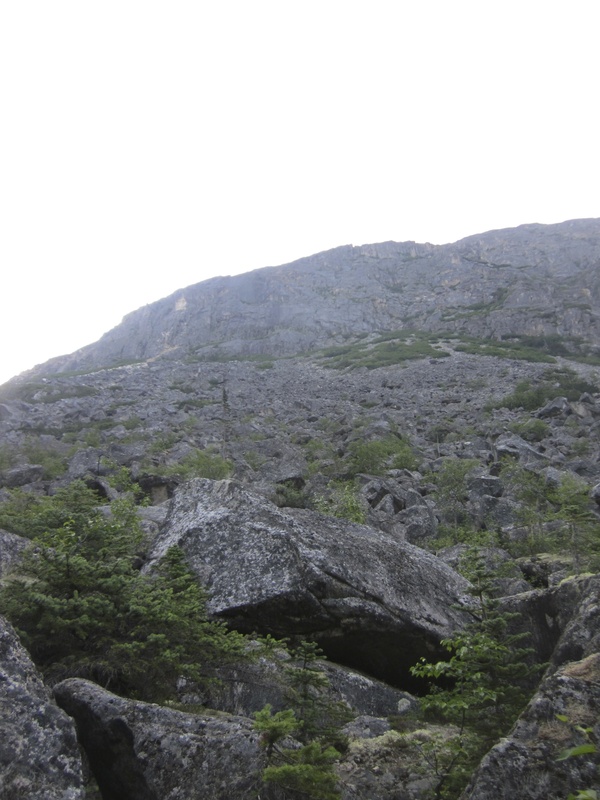 The Golden Staircase was the nickname for the part of the trail leading up to the summit. If the stampeders could just make it over this nearly 45° incline and to the other side, they would be on their way to the gold! 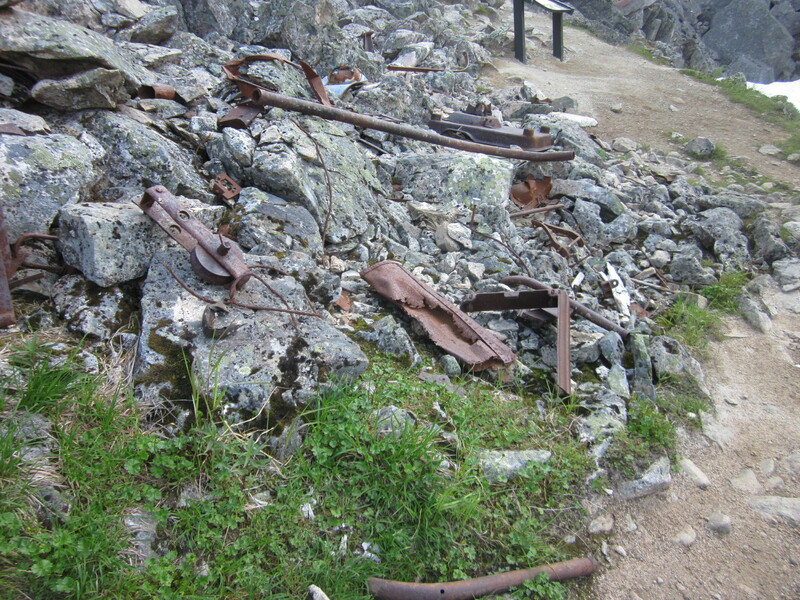 See the trail markers in the foreground? Life savers! We still had quite a ways to go, so we kept trucking along. 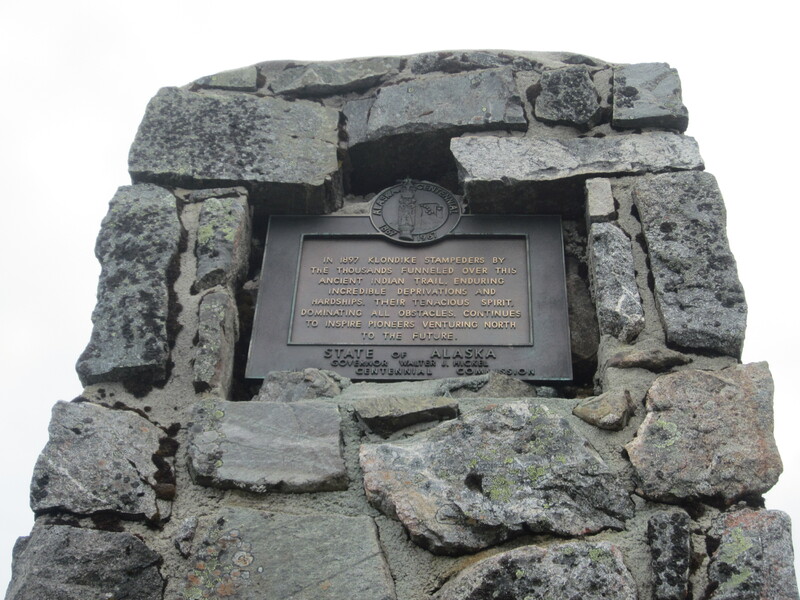 We finally arrived at “The Scales,” a place where the stampeders would reweigh their loads- they were required to carry 2000 pounds over the pass- before they could head over the summit. 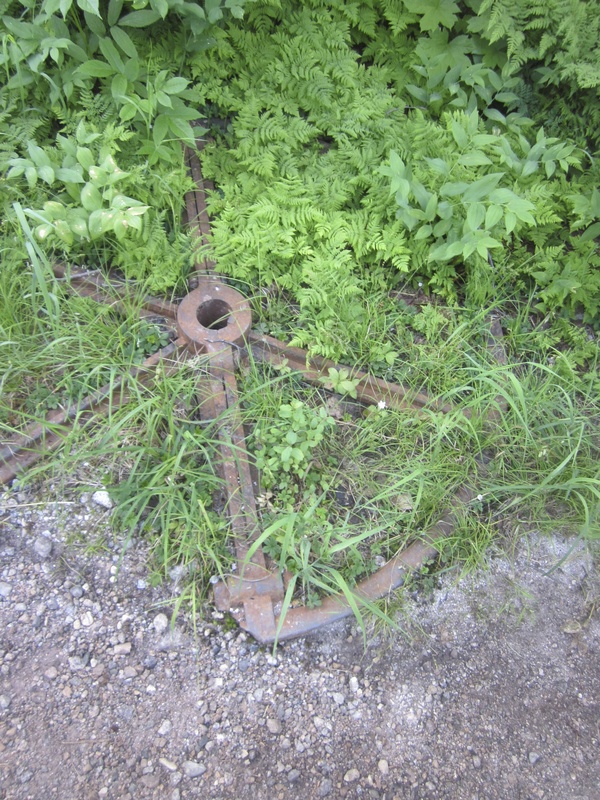 Here many gold hopefuls discarded much of their equipment and turned back, discouraged by the treachery of the trail. 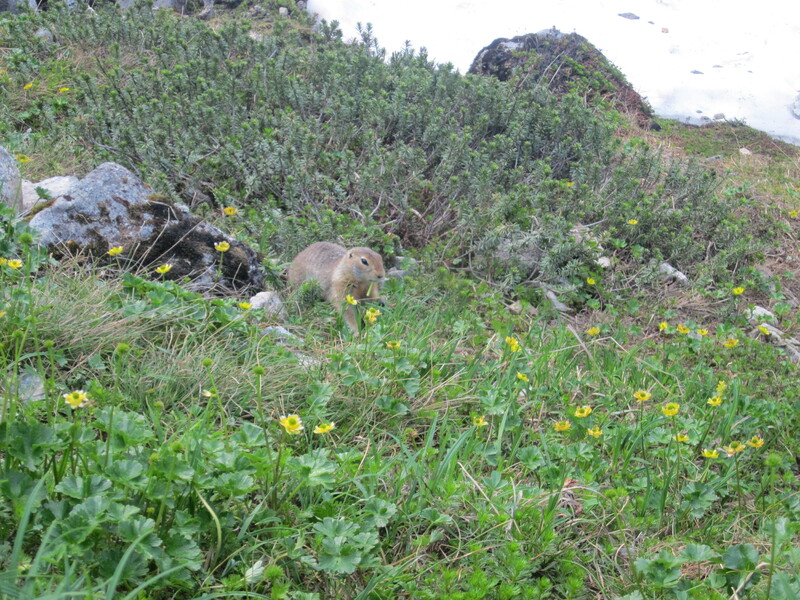 We spotted a friendly little marmot exploring the goods. We looked ahead, knowing that the staircase wasn’t so far off anymore. There’s actually a person on the staircase on the picture below. 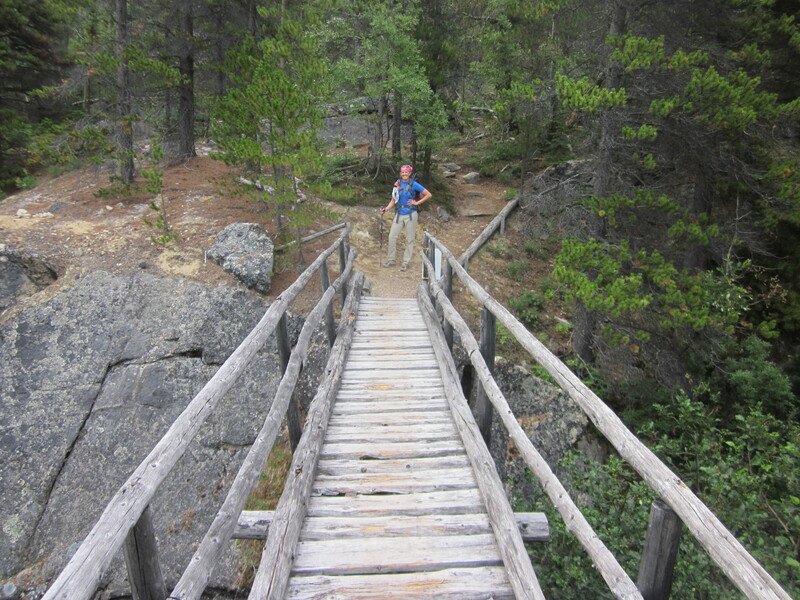 We crossed another snow bridge and we were at the base of the staircase. Gulp. This was no joke. 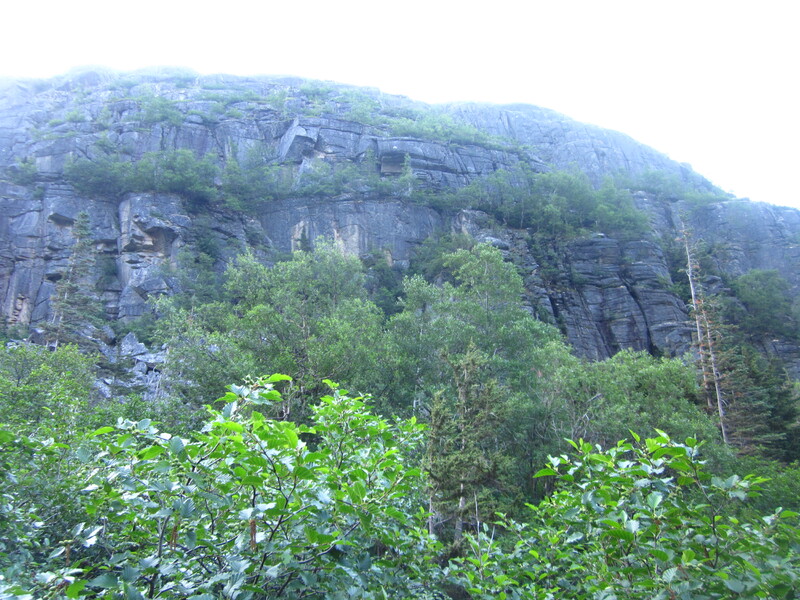 I was going to be doing some rock climbing- which I’ve never done in my life! Bill is quite experienced when it comes to rock climbing, so he told me the basic rule- don’t move a hand or a foot until the other three are firmly planted. Make sure to get a positive handhold before moving to the next one. I looked back one more time at how far we’d come. The group we’d passed at the river crossing was still pretty far behind. I’ve gotten this far, now I just need to get up to the top! 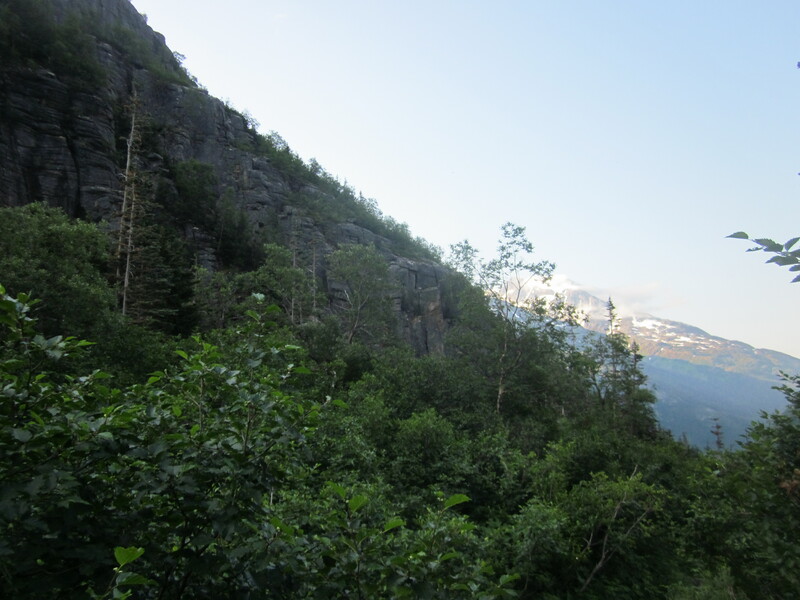 I slowly but surely started to move up the mountain, but I was scared as heck. I began breathing heavy and tried to hold back my tears. What if I fall backwards? What if I can’t find another good hand hold? Where do I go next? Bill positioned himself behind me, so that he could help me in any way possible. 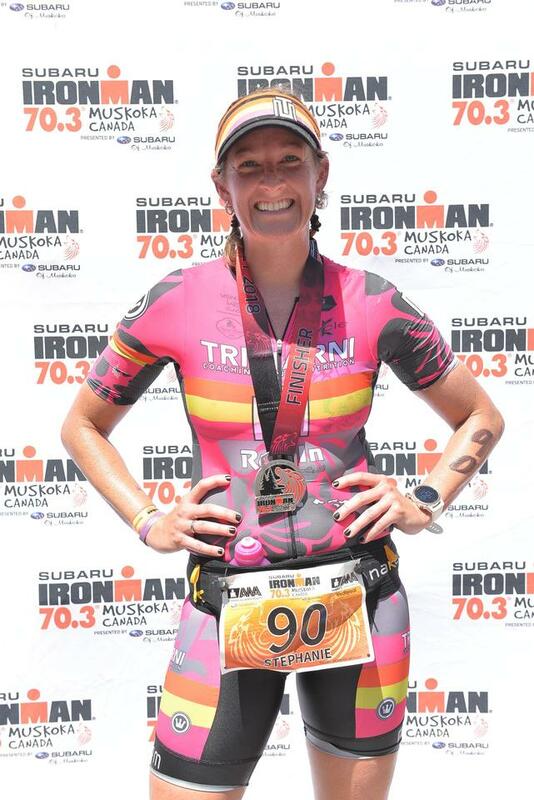 He stopped me, and calmly asked if I was breathing hard because I was scared or because I was winded. Definitely scared. He reassured me that everything was going to be just fine; that he was there to help me and that I was draining myself of energy by getting anxious. 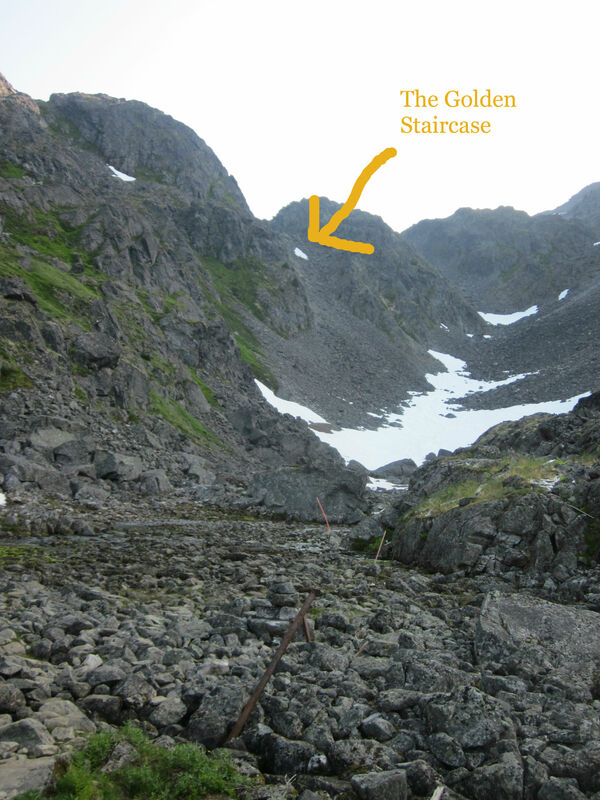 People who we had passed on the trail earlier had made it to the golden staircase and were easily making their way up, past us, and on to the top. Finally, I’m not quite sure how, I made it to the top. The view was incredible! We were SO LUCKY to get a clear day! 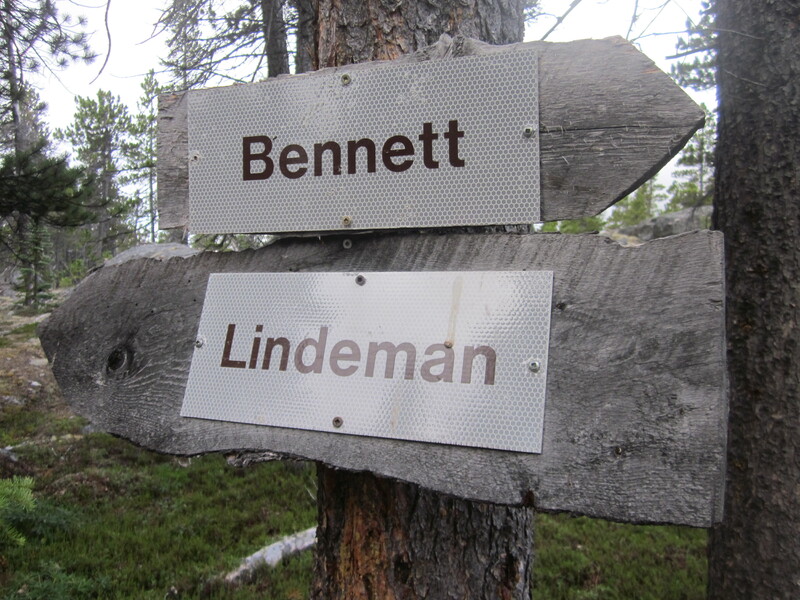 People we met along the trail who had hiked it before said that they never knew this sign was up at the top! It had always been too foggy for them to see! We didn’t hang out for too long because it was starting to get windy and chilly. 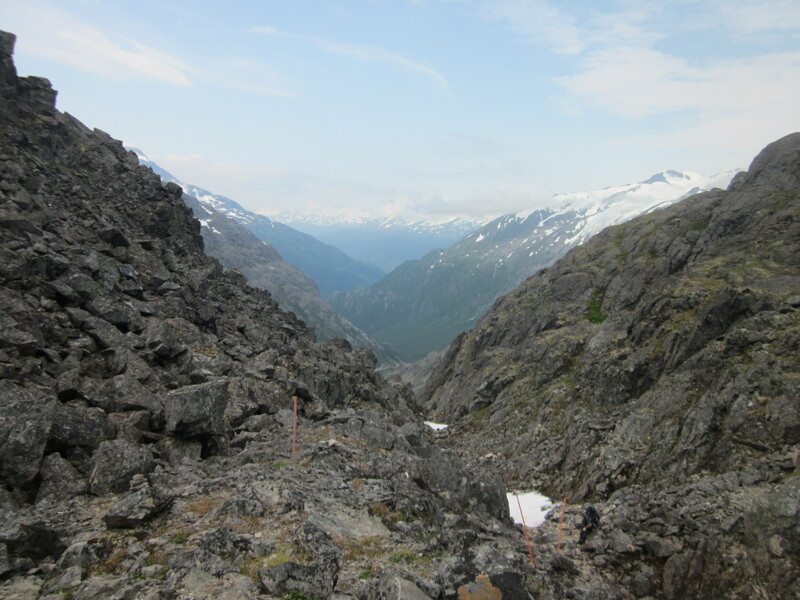 We also knew that we were only half way- the descent can often be worse than the climb, and we weren’t sure what to expect from the descent. We were welcomed into Canada with a snow covered trail. It was windy and the sun had hidden behind some clouds, so we crossed it quickly and made it to the warming station to refuel and warm up. 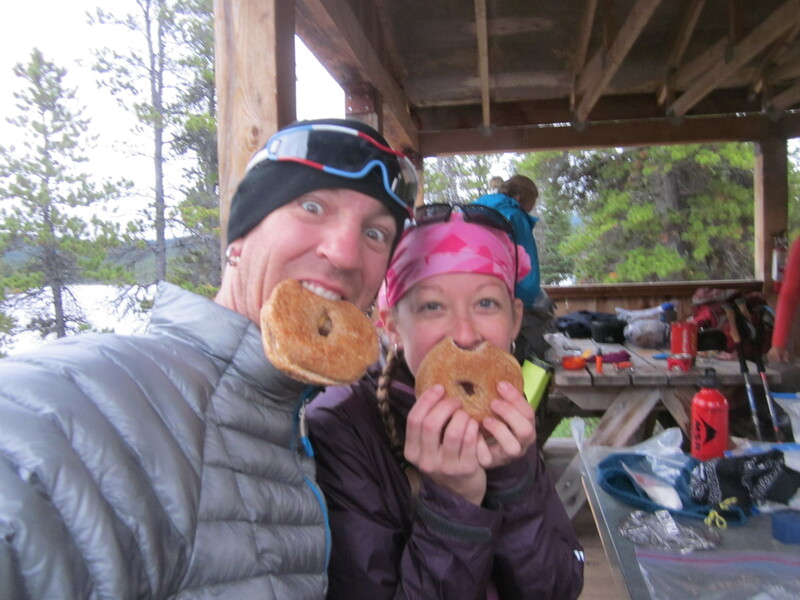 We filled our bellies with more bagels and cheese as well as some trail mix and gummy bears- gummy bears were an AWESOME idea- before hitting the trail again. 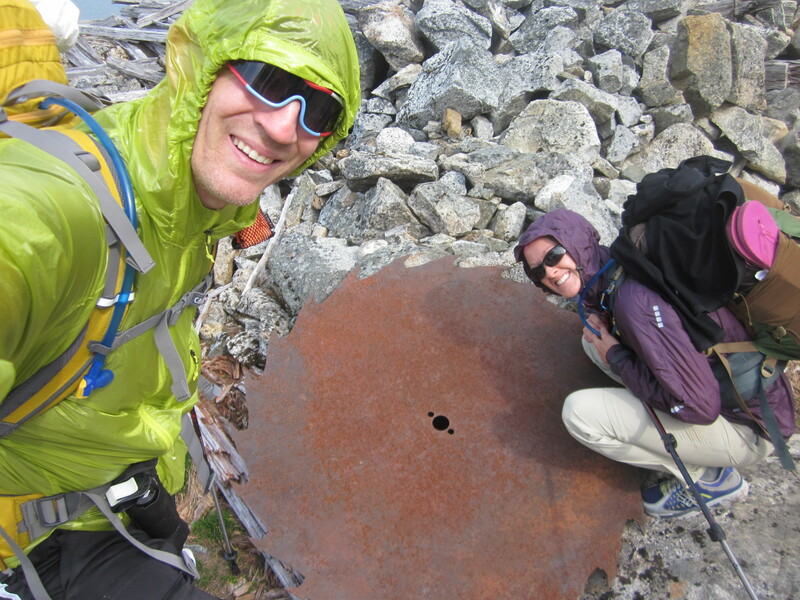 We were just asking ourselves if we had missed the big saw blade we saw in so many pictures from the trail when we discovered it right under our noses! Then, things started to get a little sketchy. 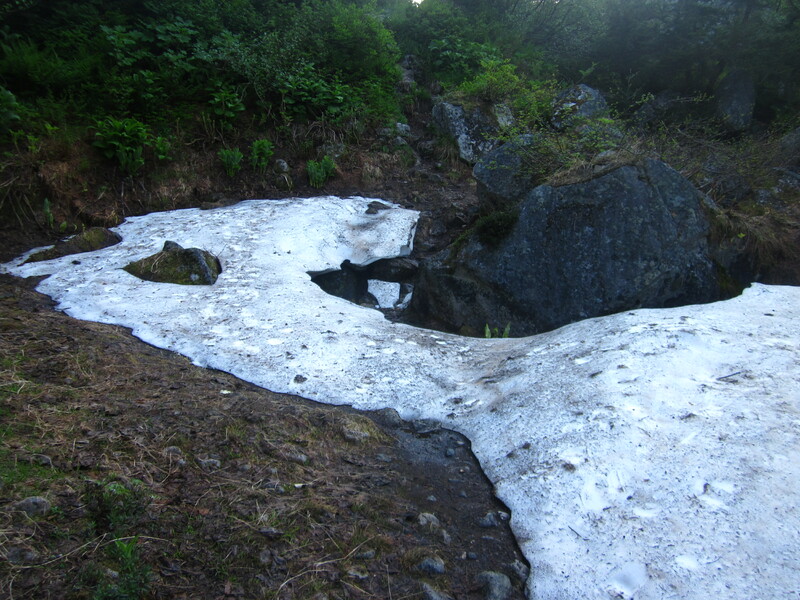 The mountain was still snow covered (actually only 40%, but it was definitely enough) along the trail and it was a little icy. 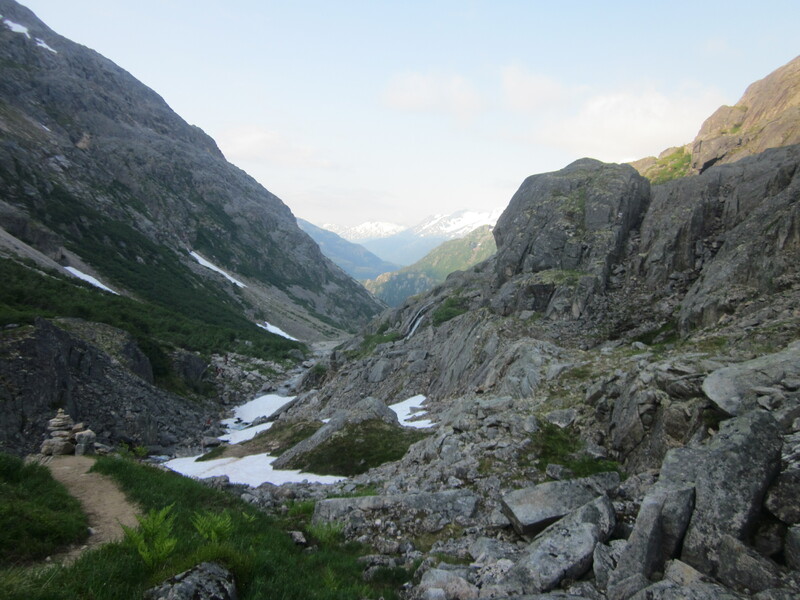 I wish I had taken a photo, but the trail ahead was a snow bridge, at least 100 yards long, and it was along the side of the mountain. There was snow to my right, all the way up the side of the mountain. 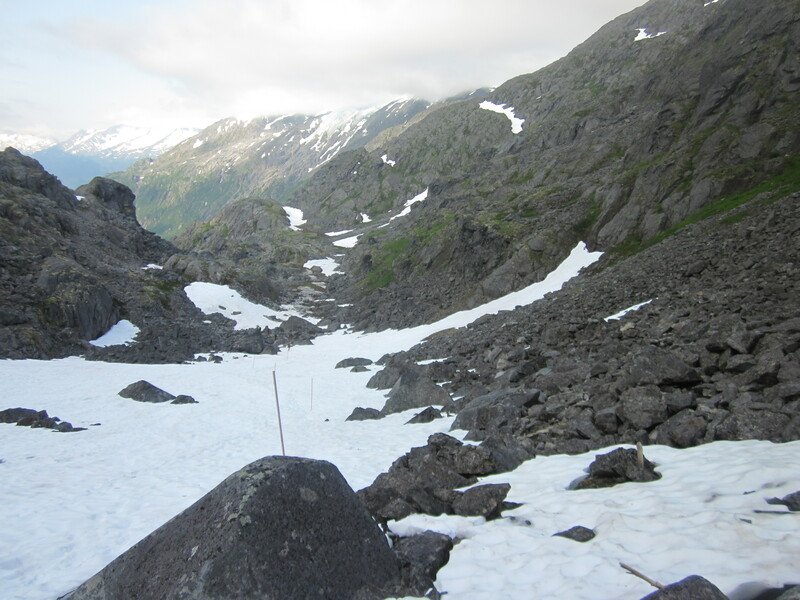 There was snow to my left, down the mountain, for about 40 feet or so, before it had melted away and large rocks showed. Beyond the rocks was a long way down to the lake. Believe me, you did NOT want to fall down. 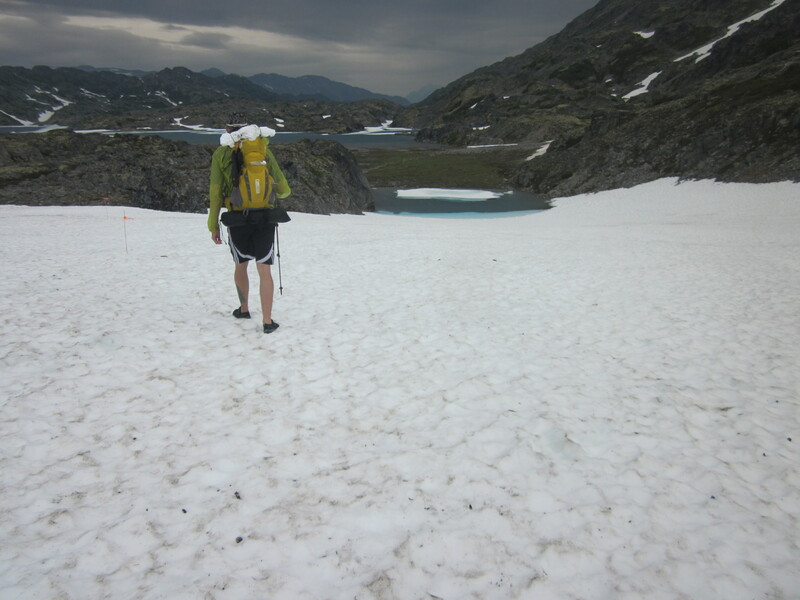 Bill had been wearing his Luna sandals for the entire trail so far, but this patch of trail was too dangerous (and cold) for his sandals. 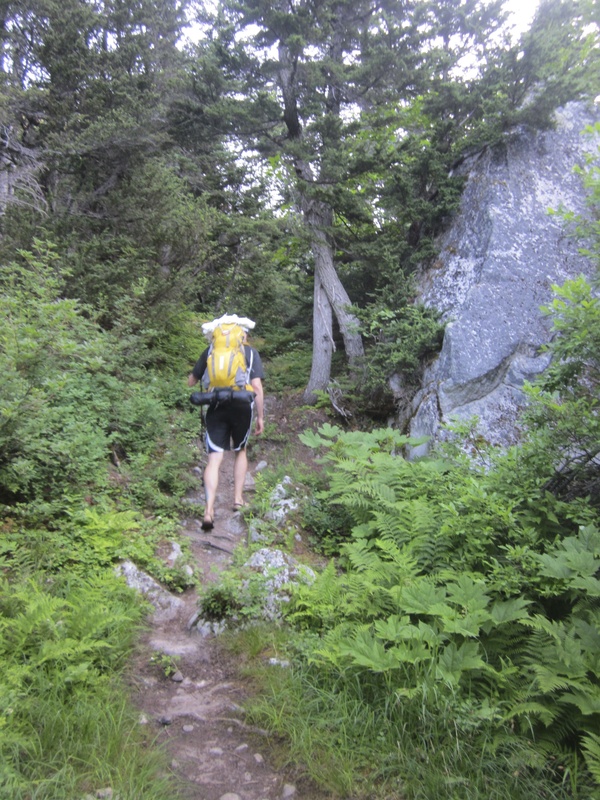 He switched into his Merrels, and followed behind me, lightly holding onto my pack in case I were to fall. 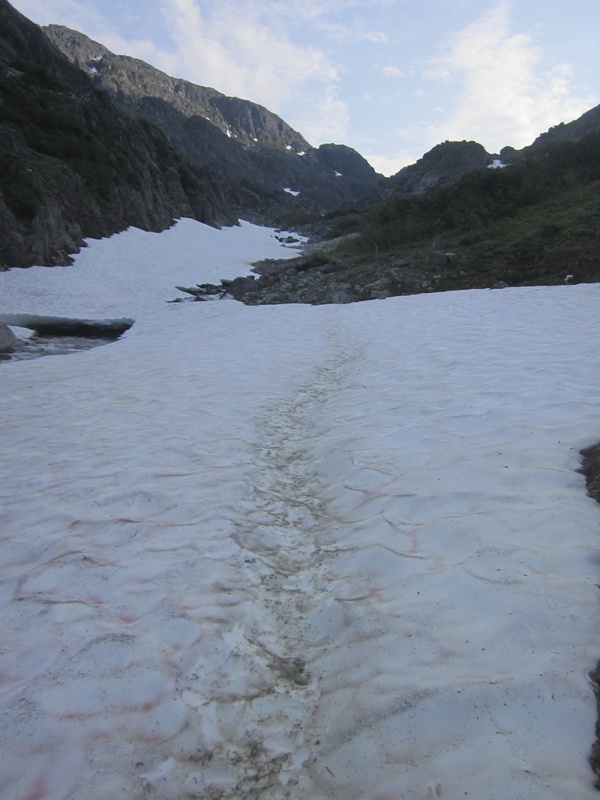 We worked together, slowly making our way across the icy trail. I was trying to dig my heel in first to make a “step” but unfortunately my shoes were not doing a good job. Instead, I put my foot down, and then, moving my foot back and forth, I used the side of my shoe to make a step. 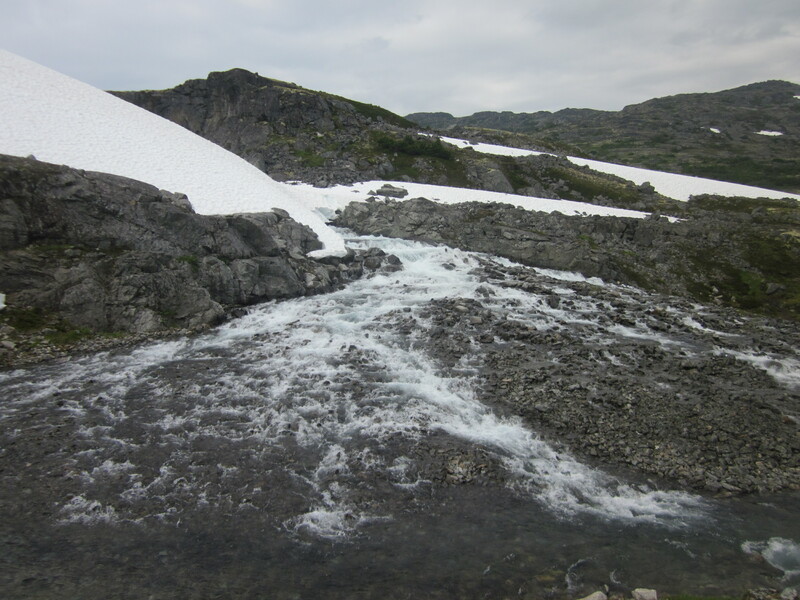 I had my trekking pole in my left hand, the side closest to the drop, and my right hand was free so that I could lean towards the mountain and try to grab the snow if I needed to. We hadn’t gone very far when another couple that had been in the warming station with us passed by. They had proper footwear and a set of trekking poles each. 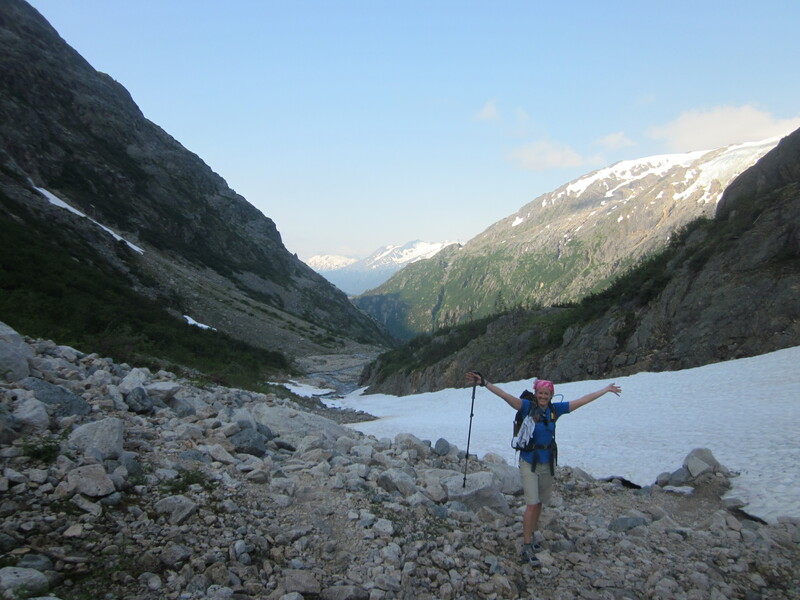 They offered their poles to us, but we declined; I think it was more that we needed foot traction rather than poles. They did however, say they’d make steps with their feet for us to follow behind. 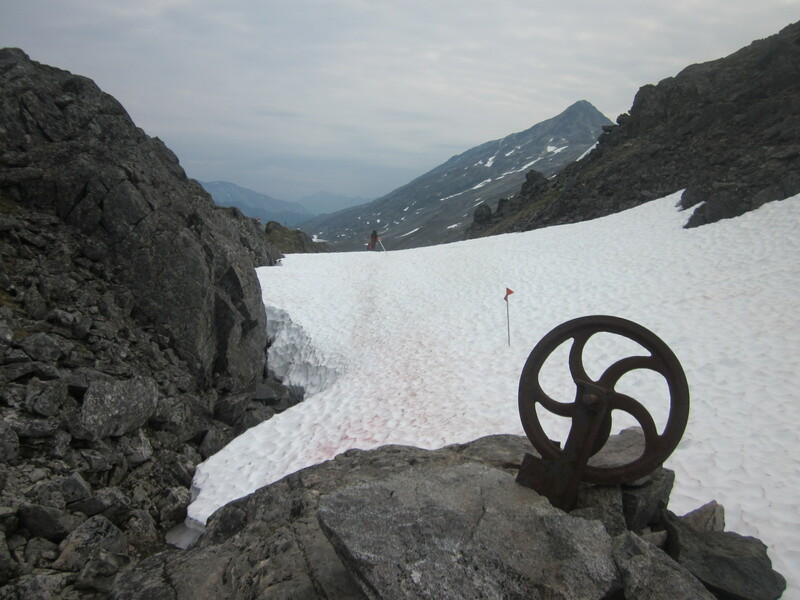 Finally, we made it to the end of the snow bridge (for now). We were out of water, so we stopped at the lake to get some. I sat behind a rock to block the wind while Bill ran to the chilly water to fill up. When he got back, we looked up and realized that we probably hadn’t chosen the safest place to fill up. It certainly looked like prime avalanche territory. So, we put our camelbaks away and got back to the trail. 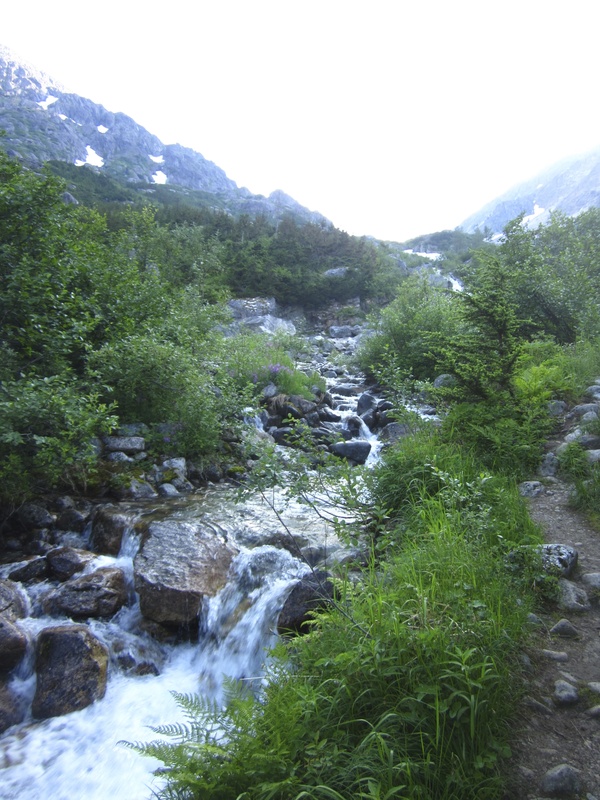 The next section of the trail included water crossings. A LOT of water crossings. And more snow. ARGH! 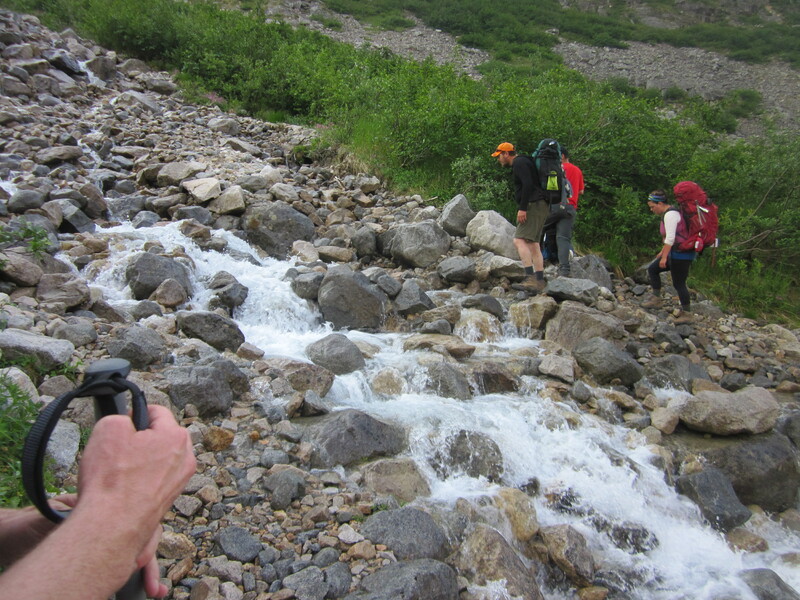 The water crossings became so frequent and in a lot of cases, it was probably more dangerous to try and hop from rock to rock to avoid getting wet, that eventually I just started to walk through them with Bill. When the water was running pretty hard, we held hands and walked across together. The water was never higher than my ankles, but my shoes definitely got wet. The water went over the sides and seeped into my socks. Awesome. 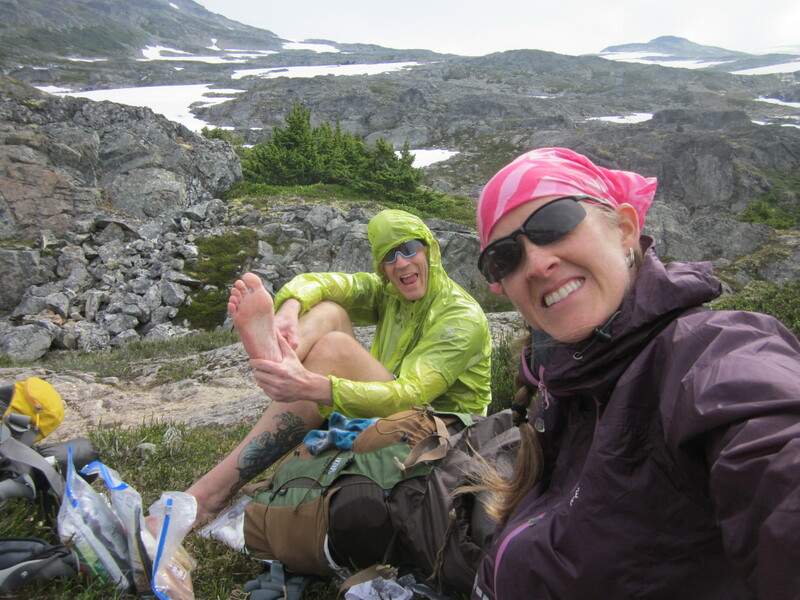 We stopped for a snack in a safer spot, and I changed socks while Bill warmed up his feet (he had put his sandals back on!). My shoes were soaked, inside and out, and I really didn’t want to put my freshly dried and warm feet into my shoes. So, Bill busted out his “ultra-light dry sock kit” aka baby powder and plastic bags. It actually worked pretty well! 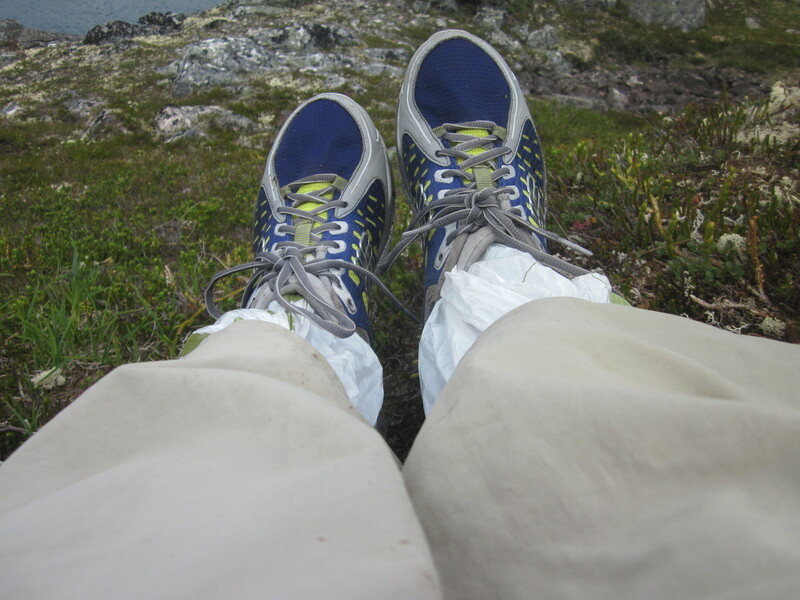 Unfortunately, one of the bags had a hole in it, so eventually water seeped in, but my feet stayed pretty dry for the rest of the day, even after more water crossings! 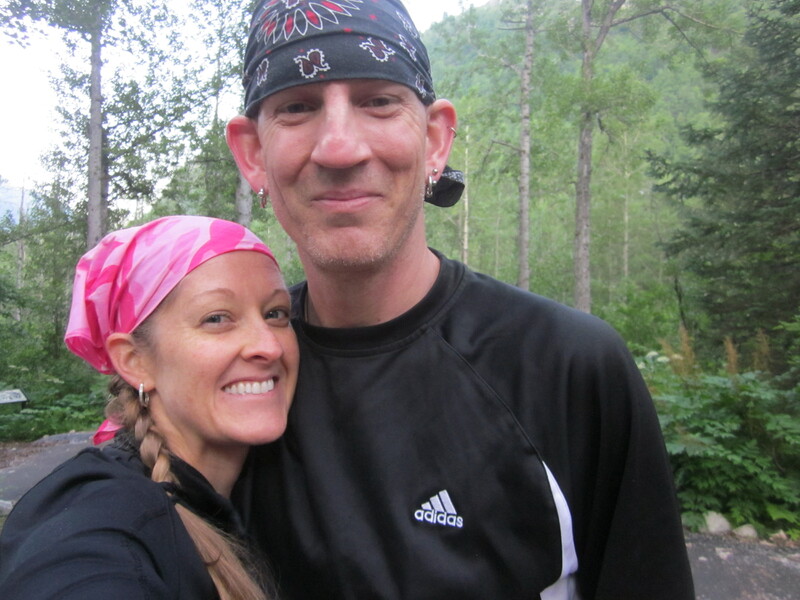 We were so relieved when we reached Happy Camp (mile 20.5). It was a little windy still, but now that we were at a little lower elevation, it was a bit warmer. 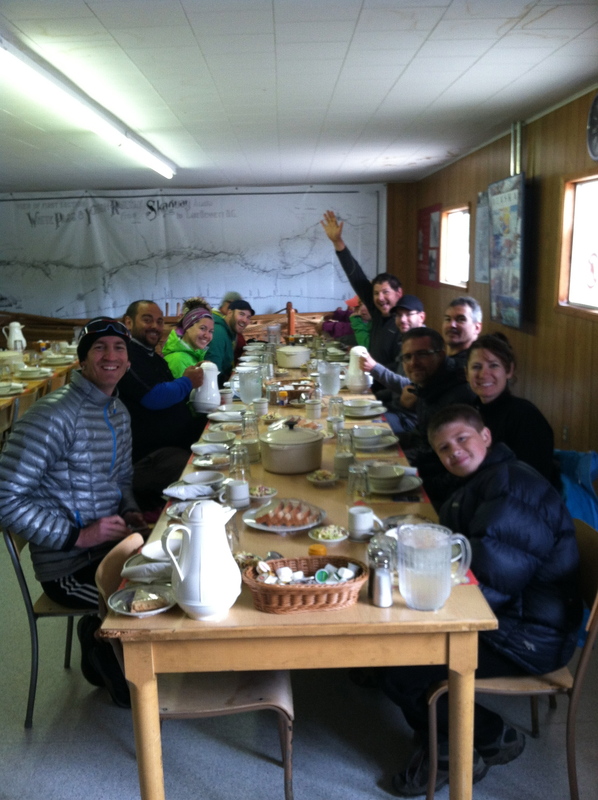 We went to the warming hut to rest and refuel, where we met two couples. We chatted with them for a little while, and they told us it was only 2pm (I don’t remember if it was 2 Alaska time, or 2 Yukon time though). 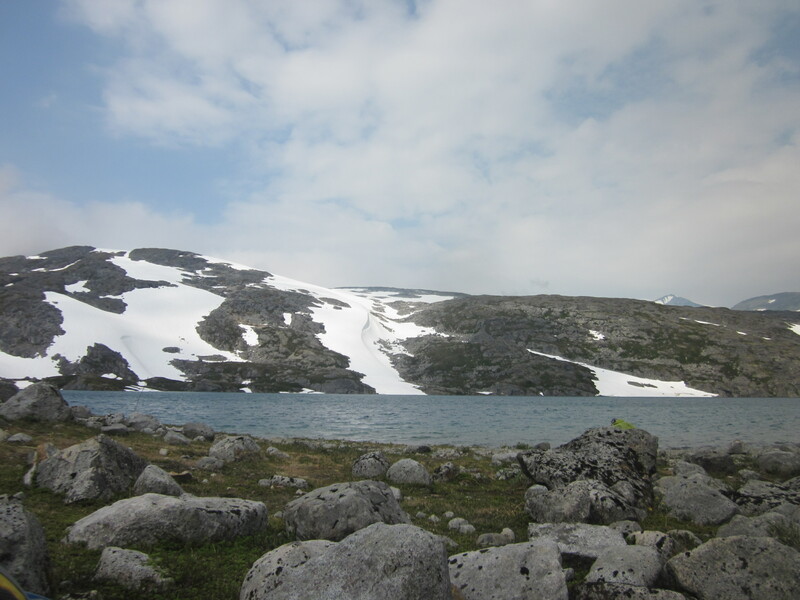 We had initially planned on staying there for the night, but since it was so early and the sun was shining, Bill and I decided to head on to Deep Lake, the camp at mile 23. 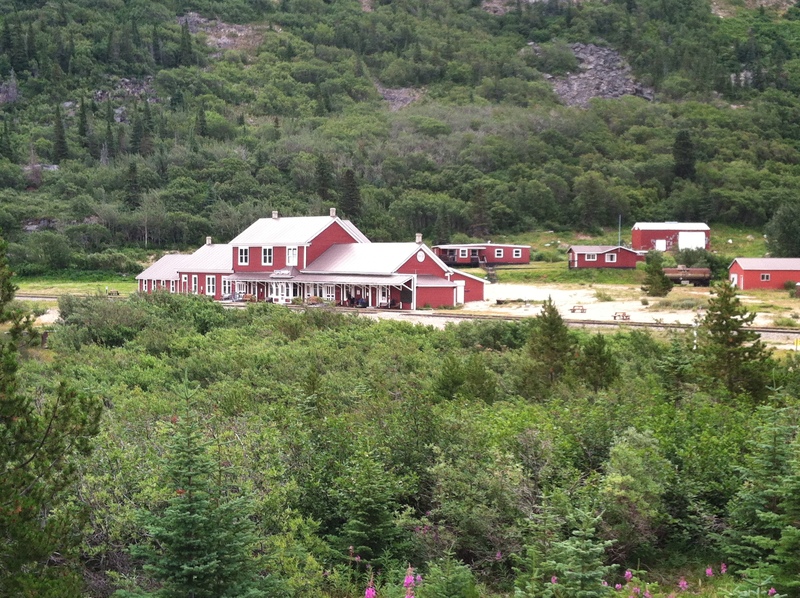 Staying at Happy Camp would have left us with an 8.5 mile hike on Day 3. 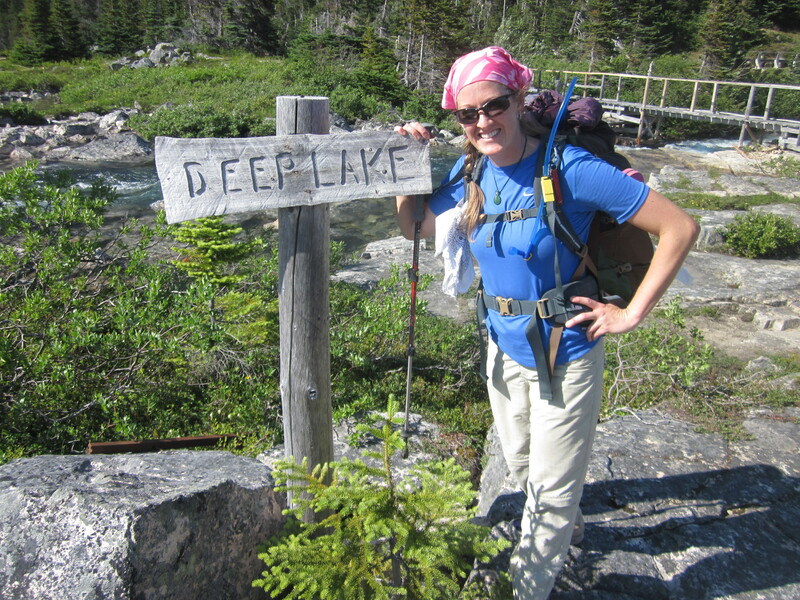 Moving on to Deep Lake would make Day 3 a bit easier- only a 6 mile hike. So after spending a good 45 minutes or so in the warming hut, we packed up and headed out. 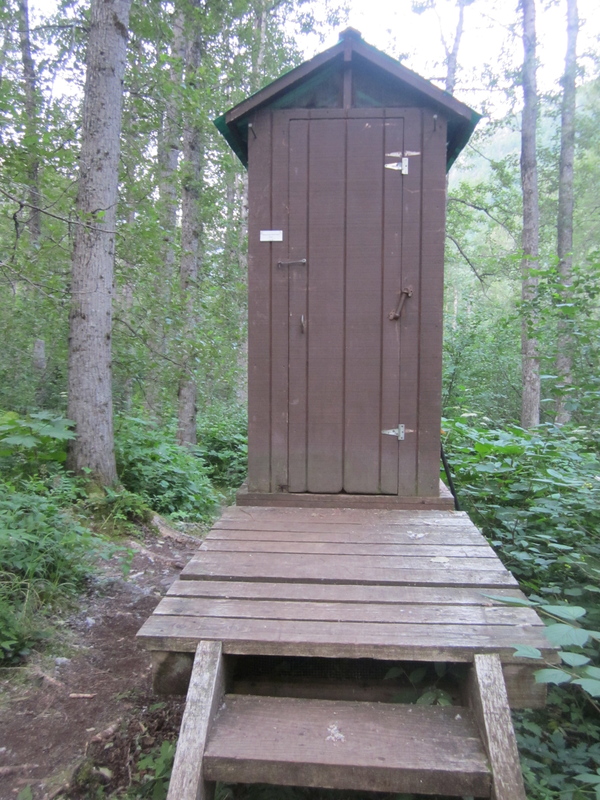 We weren’t sure if anyone else had headed out or if most of the hikers would stay at Happy Camp. Regardless, we had a 2.5 mile hike to go. 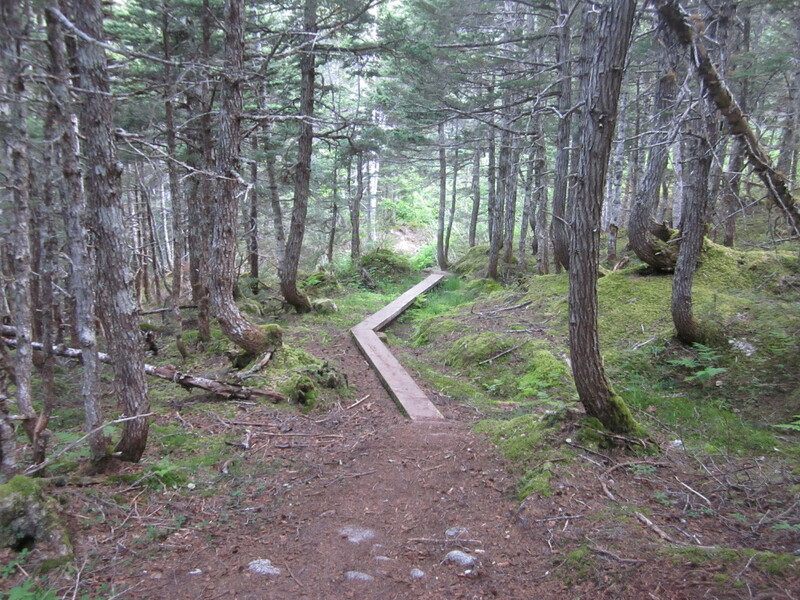 The first part of the trail, right out of camp, was a little tricky. 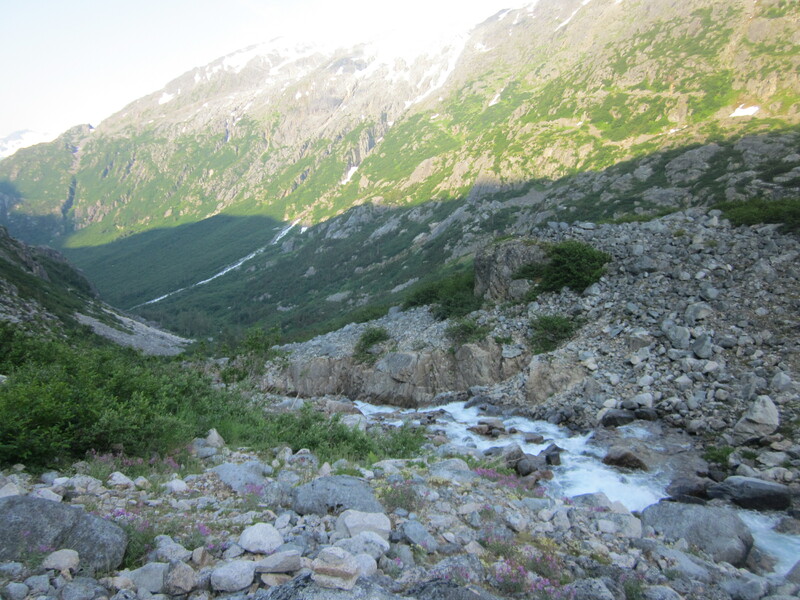 The path was narrow and rocky, and if you fell, you would tumble 6-10 feet into the sparkling blue lake that was probably FREEZING. 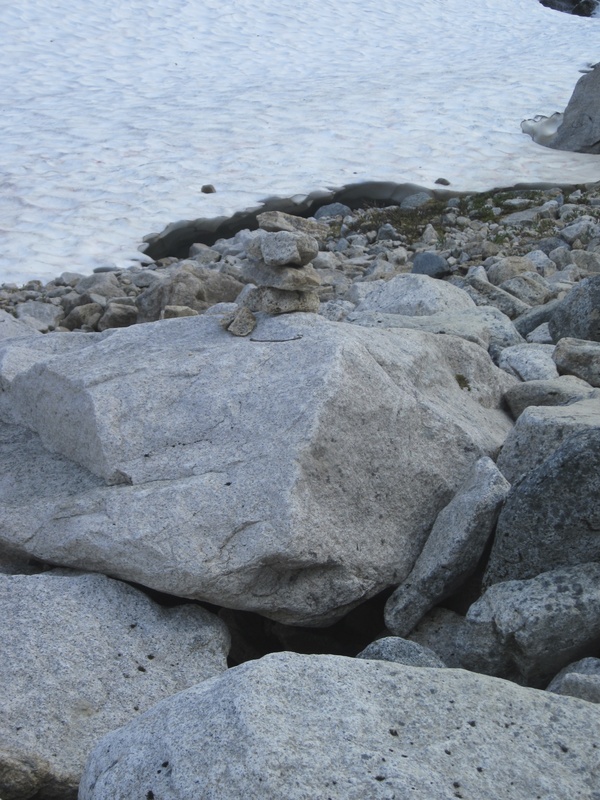 The trail widened some, and it grew a little less rocky. Remember how I felt the last 2.5 miles on day 1? That’s exactly how I felt for these last 2.5 miles. When would we reach camp? These were the longest 2.5 miles ever. Bill and I were both getting tired, our feet hurt, and I was starting to get grumpy. Bill tried to be funny at one point, and I wasn’t having it. I was so over walking; I just wanted to sit down at camp! Just over the bridge was camp! We finally made it! We were the first ones in camp, and as we were setting up, we wondered if we were going to be the only ones there for the night. I was kind of scared about being the only ones there all night, but about an hour or so after we had arrived, a family of three arrived. I (internally) breathed a sigh of relief and went to fetch some water for dinner. On the menu for tonight: Chicken Tortilla Soup! Anyhow, as we were wrapping up our dinner, the family joined us in the eating area for their meal. 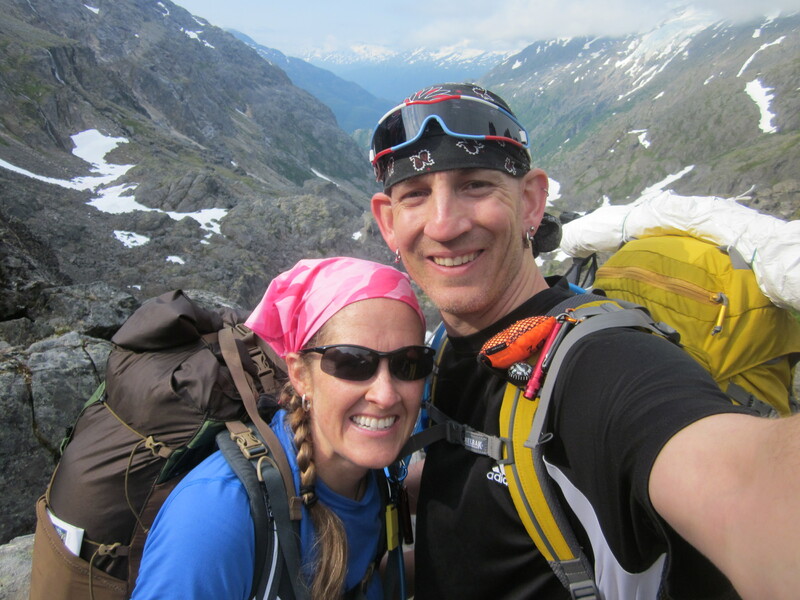 We ended up chatting with them for quite awhile- Julie, Jared and son Trevor were from Juneau, and Julie and Jared had hiked the trail several times before. It was Trevor’s first time (he’s headed into 8th grade) and we enjoyed sharing stories from the trail so far with each other. 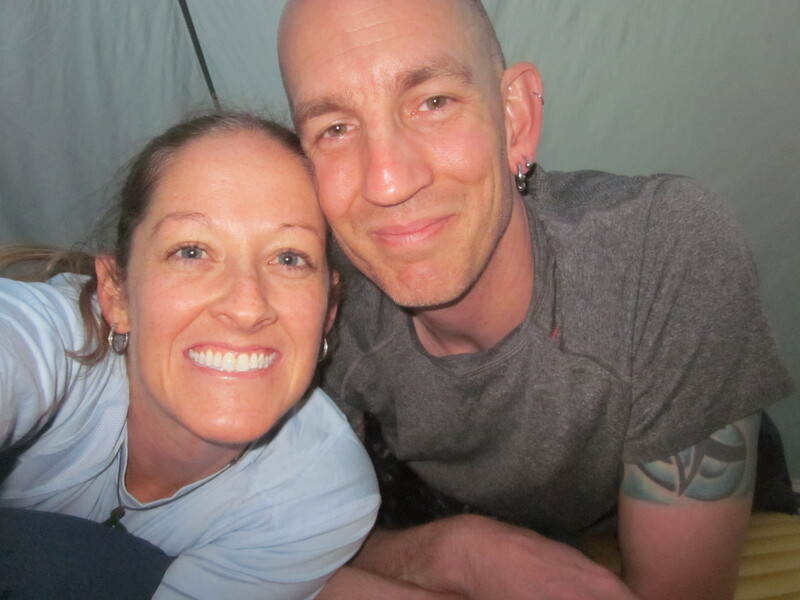 By the time we had finished eating, it was starting to get chilly, so we headed back to our tent to change and get ready for bed. It was still light out, but we were beat! What an exhausting but rewarding day! It was crazy to think of how far we’d come today, physically, mentally and emotionally. I put on my eye mask and curled into my sleeping bag. I was SO ready for an “easy” day tomorrow!